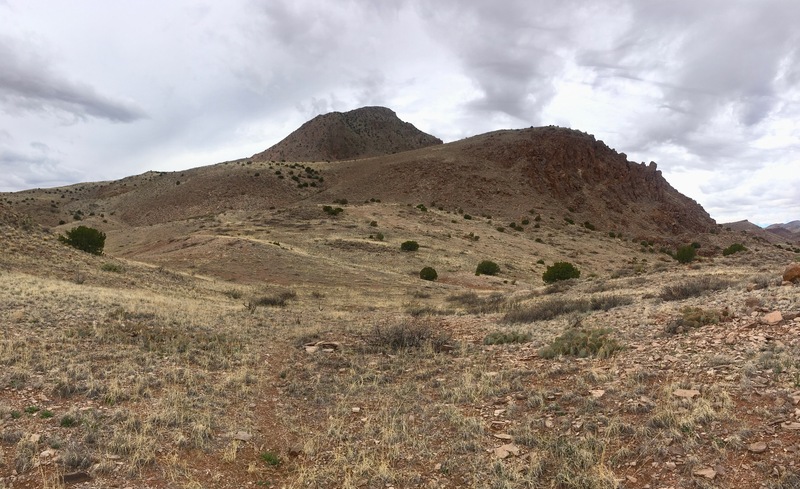 Central New Mexico contains many hiking gems, but even in that company the Hop Canyon Loop in the Magdalena Mountains is a lustrous stunner. It offers easy access, a clear tread, vertiginous canyons and an unruly mob of high and darkly forested peaks. 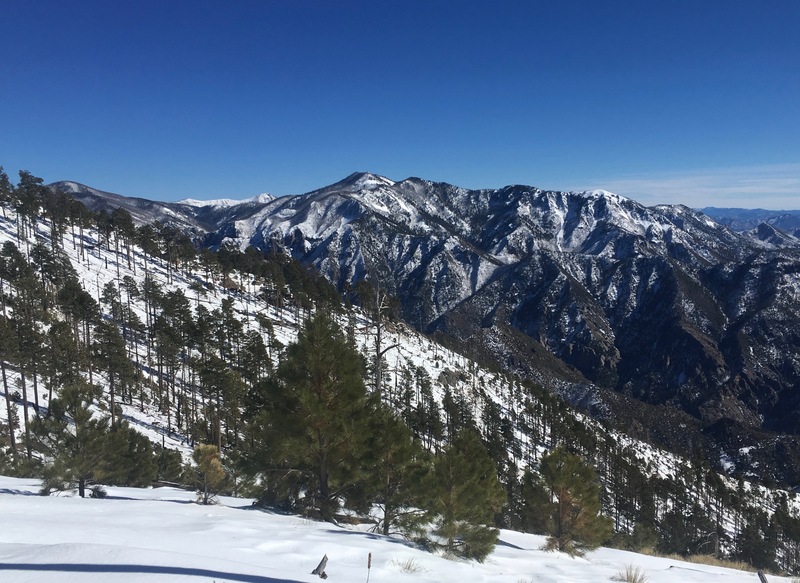 The Hop Canyon Loop tours a sky archipelago and offers a lightly exposed extension onto North Baldy Peak. 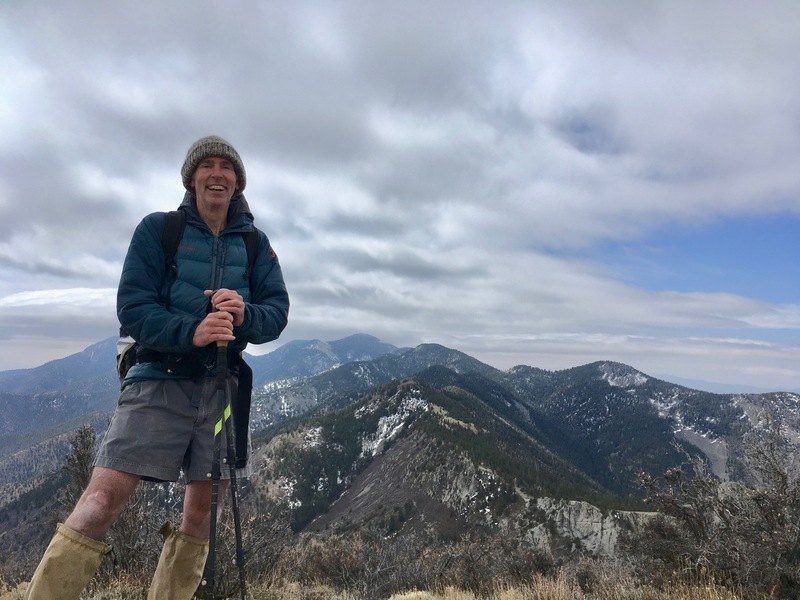 Ambitious hikers could add a second side trip to South Baldy for a rousing and exhausting day in the mountains. From I-25 (going either north or south) take Exit 147 for Socorro, NM. The exit ramp turns into the northbound lanes of California Street. Reset your odometer as you pass the first gas station. After 0.6 miles on California St, at the first stoplight, turn left onto Spring Street. After 0.4 miles on Spring Street, at the first stop sign, turn left onto US-60. After 25.8 miles on US-60, immediately past the Forest Service Station in Magdalena NM, turn left onto South Kelly Road. After 2.0 miles on South Kelly Road, at a fork, veer right onto Hop Canyon Road. (There is no road sign, but a sign at the fork has a right-pointing arrow labeled “Hop Canyon”). After 4.4 miles on Hop Canyon Road turn right onto the trailhead parking area, signed, “TR 25”. Paved roads lead almost all the way to the trailhead. Hop Canyon Road becomes a gravel road after 2.0 miles. The roadbed narrows and degrades as you go further up Hop Canyon. Leave the Porshe at home. With careful steering, however, even a soft-suspended sedan can be driven to the trailhead. A pine-shaded gravel pad offers parking on the west side of Hop Canyon Road. There are no toilets, trash receptacles or water service. (Water flowed in a seasonal stream across the road, unreliable in warmer seasons). If you wish to follow a clockwise loop, then cross Hop Canyon Road to find the trail. There is a sign saying 25A about 20 feet into the woods. If you wish to follow a counterclockwise loop (heading for South Baldy) then stay on the west side of the road and look up-canyon for the trail. About 100 feet up that track you will find signs saying “TR25” and “North Baldy Trail #8 / 5 miles”. Cross Hop Canyon Road and follow the trail past a sign for trail 25A. The trail briefly descends the canyon, but then turns east to cross a waterway. On this date there was a good flow of water, but no difficulty crossing dry footed. The ponderosa in this small canyon soon disappear. The open, drier, northwest facing slopes support pinion and juniper in graciously spaced intervals. The spacing permits views down Hop Canyon to a small butte called Elephant Peak. The trail segues into an unnamed sidecut to Hop Canyon and begins a gentle ascent. The wall to your right lies on the flanks of point 9613 (per USGS maps). The cliff-ringed summit of this high point can be recognized from many points on this loop, a useful aid to navigation. As you climb views open over the flanking western hills to the distant and rarely visited Withington Wilderness. Keep your planning for future hikes in careful check and focus on ascending the trail you are on! Near the top of this first canyon note the odd talus field on the right. Talus falls from many of the cliffs in the Magdalenas, but the canyon top is cliff-free. Perhaps, you might muse, the rocks are mineralized so as to be susceptible to radical freeze-thaw cycles. With that thought in mind, be rewarded by the sight of an abandoned mining dig at 1.3 miles, atop a small saddle. The trail turns southeast and begins a series of switchbacks threading through ponderosa pine and Douglas fir. On this date short patches of icy snow hogged the trail – footing was awkward on these sun protected slopes. Peek-a-boo views open to the north, including close-by Granite Mountain northeast of the town of Magdalena. At 2.4 miles from the trailhead, immediately below a second saddle, come to an obvious trail junction. Don’t be fooled – the intersecting trail is but an elk boulevard. Continue straight across and rise to the saddle. The trail turns left in the saddle, pulling away from point 9613 and pushing towards the main ridge. Ascend sunny meadows housing lofty ponderosa, which thin to montane grasslands as you near the ridge. Contour southwest (right on ascent) around an open knoll. The main loop is going to take you south (to your right) onto the main ridge. A notch in the ridge lies below your feet. From there the ridge rises south as a crescendo of darkly forested humps, hillocks, knolls, knobs, knuckles, and frank mountain summits. The challenge is to pick out South Baldy without stumbling. 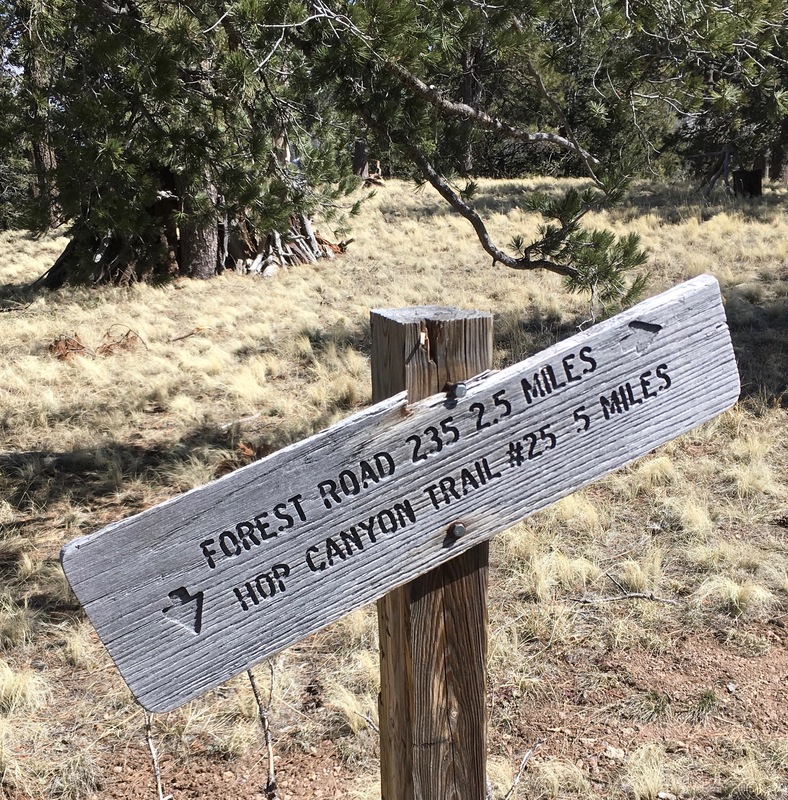 At 2.9 miles from the trailhead come to a forest service sign saying “Hop Canyon Trail #25 / Forest Rd No. 101 2.5 miles”. Here Trail 25A ends at a T-intersection with Trail 8, the North Baldy Trail. To your left the North Baldy Trail ascends on an obvious path. To your right there is a broad mass of ledge-laced, downward-sloping terrain. Look for cairns that lead across these rocky surfaces into the notch (mentioned above). For the side trip to North Baldy you first want to turn left. The trip to North Baldy summit is slightly longer than a half mile and lots of fun. The trail clings to rock surfaces on a narrow ridge top. Reaching the summit block the trail traverses the block’s south face through a long stretch of scrub oak, eventually discovering a roads-end on the southeast corner. The road corkscrews uphill on the east side of the summit block. On the north side the road plummets, so you must go off-trail on terrain blissfully free of scrub oak to gain the summit. There are fossils in some of the summit rocks (check the cairns). To the south lies the bulk of the Magdalena Range, including South Baldy. To the west lies the San Mateo Mountains, including the Withington Wilderness. The northwest quadrant is an inexpressibly vast plain. The Bear Mountains lie close-by to the north. Beyond, the huge bulge of Mount Taylor dominates the horizon. The east side is a hodgepodge of ranges, most of which were not visible on this hazy day. Close in, and visible despite the haze, was the Sierra Ladrones, Strawberry Peak and the Socorro Mountains. Return to the signed junction and scan below, once more, for those cairns that theoretically guide you onto the southern leg of the North Baldy Trail. Descend on friendly ledges, passing between house-sized outcroppings of pale, friable rock, to lose about 300 feet onto the notch. The trail returns to its normal self, a clearly visible trough in the ridge-top soils. This trail clearly suffered a harsh winter. Push aside as many fallen limbs as you can, going briefly off-trail to avoid deadfall that won’t be bullied. Cliff-sided Point 9613 is a beacon on your right. Arrive at a high point of 9825 feet. Dark Canyon cleaves the east-facing slopes on your left. A rubble-strewn descent delivers you to a saddle and yet another rise, this time bursting through tree line to a signed trail junction. To the south (left if going clockwise) the obvious North Baldy Trail continues to South Baldy. Go west (right if going clockwise), on a faint tread that returns to the woods. A brief ascent brings you to a saddle with a view to the bald south slope of South Baldy. A small ascent still remains until you leave the rim above Hop Canyon and begin descending on the slopes leading into Agua Fria Canyon. Huge old-growth ponderosa and Douglas fir grace this terrain, a rare sight. The trail switchbacks on steep terrain and, having traveled 7.6 miles, you will arrive at a gate in a barbed wire fence. In theory you should be able to unlash a stick from the post on your left, pass through the gate, then re-lash the stick to the post. That stick, however, is broken and there is no obvious way to unlash the entire thing. The system does, however, allow you to unlash the bottom part, and you can scoot under the top part. From here the trail contours to the north on very gentle terrain. 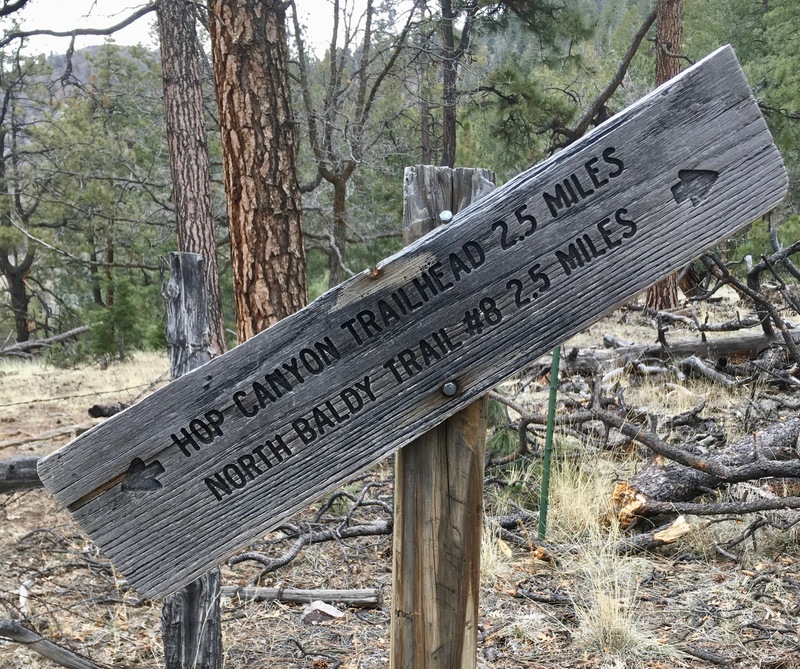 You will pass through ungated fencing at 8.2 miles where a trail informs you that it is 2.5 miles back to Hop Canyon trailhead. At 9.0 miles the tread regains the rim above Hop Canyon. Point 9613 returns to sight. Follow the rim west, along side wire fencing. Eventually the trail unexpectedly pivots back east (where did the fence go?) and writhes down the walls of the canyon. Arrive back at the car having traveled 10.3 miles. Stop in Magdalena for an ice cream, you’ve earned it! As usual with trails nearing 10,000 feet, Acute Mountain Sickness (a.k.a. altitude sickness) is a concern. AMS shows small respect for gumption, strength or experience. If your party includes hikers newly arrived from Portland (Maine or Oregon) then give them a chance to stretch out on a lower tread. If your group is adapted to altitude, then consider adding a side hike to South Baldy. That would not be especially easy (South Baldy rises to 10,800 feet) but it is fun to see the astronomical observatory and the hefty gear used at the Langmuir Laboratory lightening research facility. Clearly, you will want to avoid these ridges during monsoon season. I never put on my microspikes. That part of the Magdalena hiking season seems to have passed. Some older maps will show the North Baldy Trail clinging to the east side of the ridge line. That was not my experience. In many places it was square on top of the ridge, but where it had to depart it did so to the west. On a cold late-March day two bottles of water were fine. In warmer weather bring much more. There aren’t any reliable springs near the ridge that I could find. Tom Lohr, at the SkyAboveUs site, reports on doing this trip in the counter-clockwise direction. He mentions concerns regarding pets on this hike, with emphasis on the risks poised by mountain lions. He also mentions places where you can see the Very Large Array of radio telescopes. 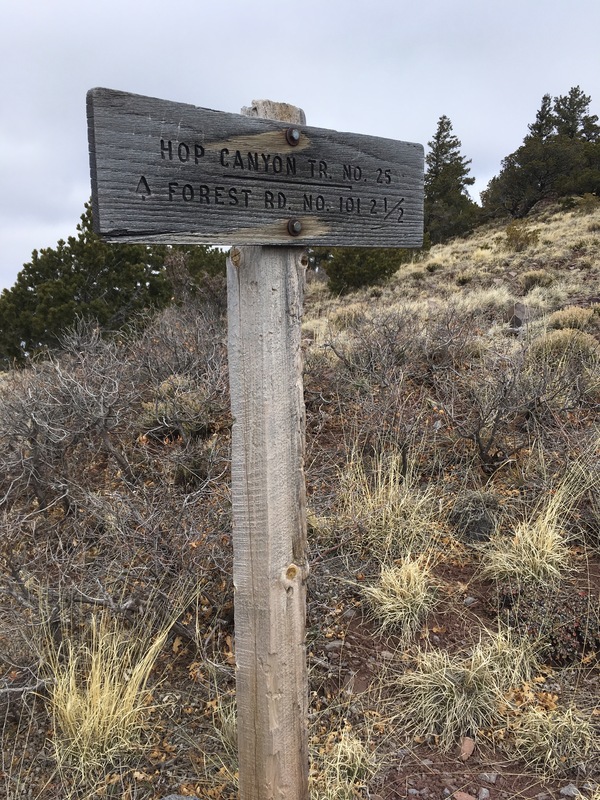 The HikeArizona site describes the Grand Enchantment Trail (GET) where it crosses the Magdalenas, overlapping with some of the loop described here. It has suggestions on where water might be found. No guarantees! Water quality on the GET can be very poor – treat any water you take. The rugged and ancient Sierra Ladones lie only 50 miles south of Albuquerque. You will not, however, be troubled by crowds. Unpaved roads take you to a ‘trailhead’ in a range devoid of trails. Towering above the surrounding desert, Ladron Peak is a trial for legs and a challenge for navigators. Experienced scramblers will enjoy the isolation and the demands. Novice hikers will not. 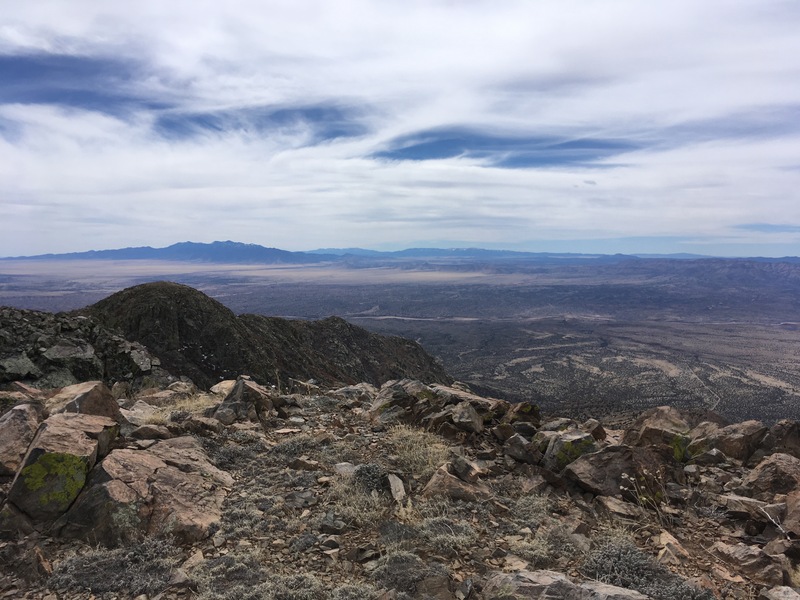 The summit offers incomparable views across central New Mexico. Take strong friends and scramble Ladron. There are two adjoining peaks that compete for “high-point” status. Older maps sometimes place the “Ladron Peak” label on the shorter, eastern summit. Current USGS maps place that label on the taller, western summit. This post follows the current convention. From Interstate-25 (I-25) take Exit 175 (about 50 miles south of Albuquerque or 25 miles north of Socorro). After 0.1 miles, at the end of the ramp, go left following the sign for North 116. (This turn could be easy to miss, the ramp is designed to merge you directly onto US-60 East). After 0.3 miles on 116, immediately before it becomes the ramp onto I-25 South, turn right onto Old Highway 60 (signed). after 0.1 miles, at the end of the ramp, immediately turn left onto Old Highway 60. (This turn might be easy to miss because the ramp merges directly onto 116). After 1.5 miles on Old Highway 60, in front of the signed gate fronting the Sivelleta National Wildlife Refuge, turn right onto County Road 12. No sign names ‘CR-12’. After 20.8 miles on CR-12, a good gravel road, veer left onto County Road E-65. No signs name this road, but look for small signs on both sides of the entrance saying “Limited Area”. After 0.8 rough miles on CR E-65, veer left onto a primitive road. From this point on a you will want high clearance vehicle. After 1.9 miles (estimated) on the first primitive road veer left onto a second primitive road. 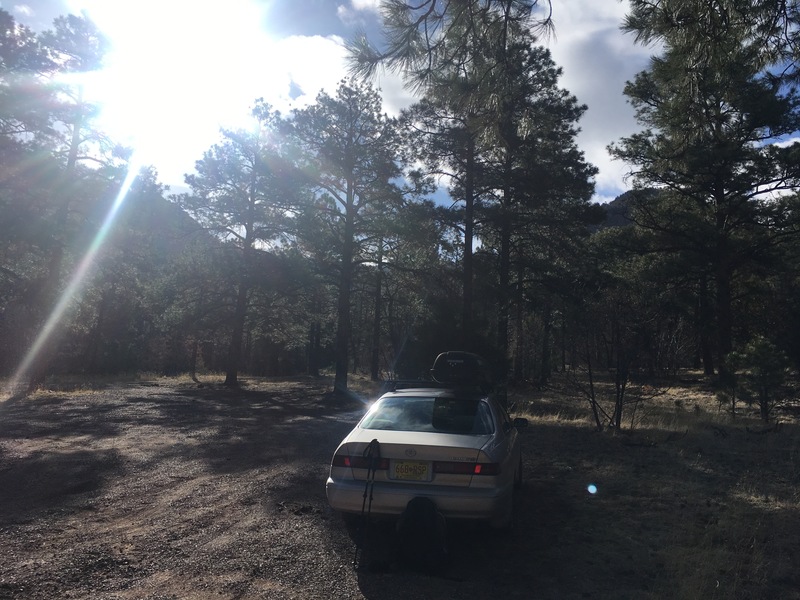 After 0.4 miles (estimated) on the second primitive road, in front of a gate in a barb wire fence, park at the trailhead. Old Highway 60 is paved at its start. After crossing a battered bridge over the Rio Puerco the pavement breaks up and the ride is very bumpy, then the road turns to gravel. A new bridge, in mid-construction, lies upstream of the battered one – this particular road-quality concern should have a short lifespan. 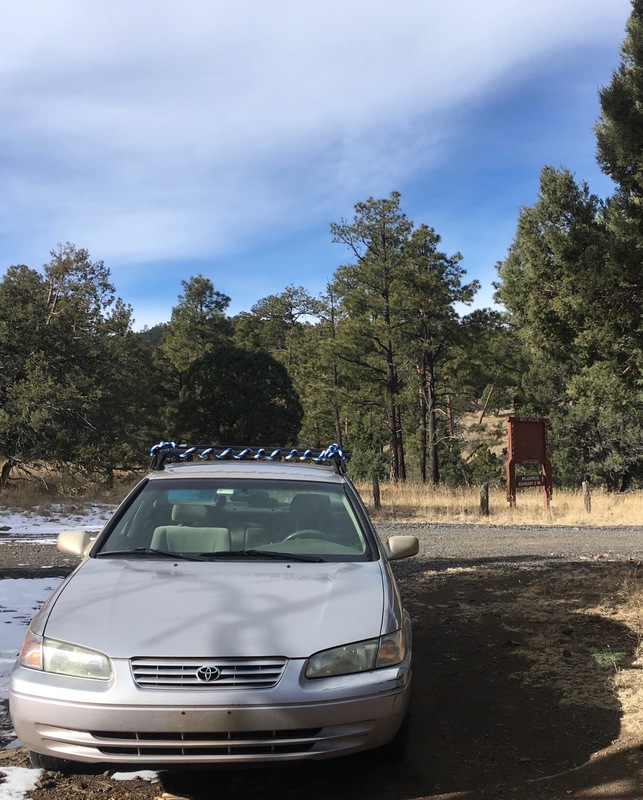 I drove only 0.7 miles on the first primitive road, at which point my worries for the Aging Camry’s suspension overwhelmed my aversion to road-hiking. As a consequence the length estimates for the two primitive roads had to be taken from Google Maps. The second primitive road ends at a gravel pad with a fire ring. There are no vault toilets, trash receptacles or water services. The flat spot where I left the sedan (off the first primitive road) offers some seclusion but little else. In the map above the yellow line indicates the ascent route while the orange line indicates the descent. On this date the hike began with a road walk of 1.7 miles. (The hiking distances listed in this description include this extra length). At the road’s end you will find a gate through a barbed wire fence. Go through the gate and onto a faint trail. After another 100 yards the trail intersects a ranch road. Make note of this junction, it would be easy to miss on return. Turn east (left on ascent) onto the road. The road soon goes through a fence opening and then passes a stone ruin. These, too, make good landmarks for your return voyage. The ranch road is cut into the south side of a hogback. A water pipe extends along the length of the ranch road. At 2.2 miles from the trailhead go past a cattle trough. It contained 6 inches of water and was frozen on this date. It also enjoyed a dense algae population. Don’t count on it as a water resource. The road soon ends, but the pipe continues along a service trail. Follow the trail until you see open grassland on the hogback above you. Ascend on loose soils past juniper and prickly pear to reach the hogback’s spine. At 3.0 miles arrive at the high point on the hogback. Descend to a small saddle and then veer northeast into a canyon (left on ascent). Here you leave the juniper realm and travel into the domain of pinyon and ponderosa pines. The track shows that I kept edging up to the east to study the high ridge line. Don’t be edgy. Stick to the pleasant, duff-dominated forest floor beneath the pines and ascend to where the forest thins out. The canyon wall south of you (right on ascent) has been cleared by fire. It looks like an attractive alternative, might it be a good line for descent? Look straight up-canyon as well. Near the 8000-foot level (at 3.8 miles) deceptive sight lines make the ridge look to be five minutes away. In fact, you are looking at a “false ridge”, the true ridge line towers high above. Clamber on, pushing your way past the pinch points on the steepening canyon bottom, until you find a way to turn east – towards the high and cliff-protected ridge that leads to the summit. 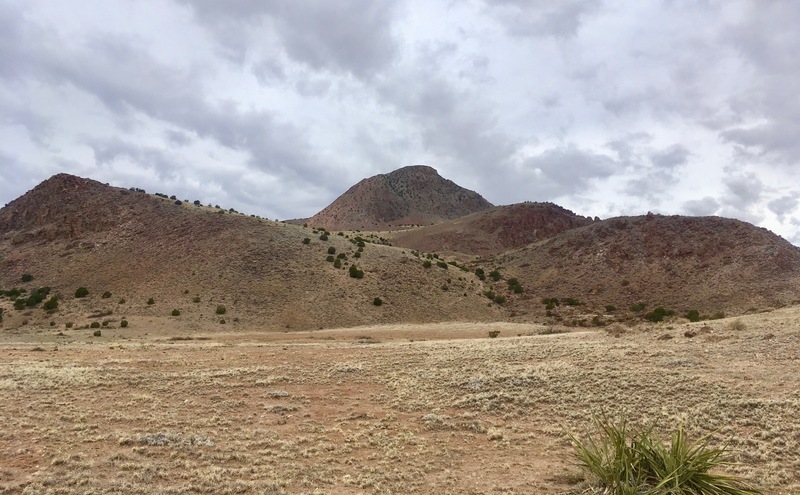 Climb steeply on loose soils, bands of recalcitrant rock, past shin stabbers, cholla and prickly pear to slight mellowing of the grade at 8500 feet (4.1 miles from the trailhead). View from mellowed slope to the main ridge, the north side (left) is cliffy. The cliff-dominated terrain directly below Ladron Peak, to the north, looms as a fortress-barrier to scramblers. Continue rising as steeply as you can but with a robust acceptance of south-trending compromises. Zig zag to avoid exposed rock faces and thickets of Gambel’s Oak – either one will blunt your pace. The rib you are climbing has several near-shelves and each shelf makes a false ridge-line to cheat your hopes. Climb undaunted until, after many rest stops, you reach a saddle on the true ridge at 4.3 miles. This is just one of many saddles on the ridge, give it some study if you plan on retracing your steps on return. Footing remains critical. Not because the ridge is steep or exposed (it is neither), but because of the columnar cacti colonies that grow everywhere. Mind toes and fingers! Turn north and follow the ridge towards the summit. The ridge runs into a lichen-bedecked boulder pile at 4.4 miles. Avoid this face by swinging to the east (right on ascent) and gingerly ascending on loose talus in a steep chute. A thicket atop the chute blocks your way. Push through to the ridge and stop to memorize how this thicket conceals the chute from descending scramblers. The only other difficulty comes at 4.5 miles. A knob ends with a fall of about 20 feet down to the ridge. Back up a few paces and descend in a narrow, boulder-strewn and east-facing chute. Fortunately, this chute is better consolidated and devoid of thickets. From the saddle at the base you can continue ascending directly on the ridge top, although an intermittent climbers tread runs along the east side. Arrive at the summit having traveled 4.7 miles into 360 degrees of awesome. In the north rises bold Mount Taylor (snow capped on this date). Sandia Peak in the Sandia Mountains and Bosque Peak in the Manzano Mountains dominate the northeast. Distant El Capitan Peak in the El Capitan Mountains and Nogal Peak in the White Mountains round out the southeast. Strawberry Peak lies near by to the south, while South Baldy (in the Magdelana Mountains) and the entire Black Range remained snow capped to the southwest. The gigantic plains to the northwest proffer the huge volcanic neck that is Cabezon Peak. It should be possible to return the way you came. The map above shows that I tried a slight variation, descending back to the saddle where I first hit the ridge line and then staying on the ridge line as it descends gently to a point directly above the entrance canyon. Gentle descents don’t loose much altitude, so at this point there is a long, steep drop into the canyon bottom. Two big chutes lead down to the canyon. Pick the one to the north (right on descent) as lively drops bedevil the south chute. What follows is a long, sketchy scramble down talus slopes and scratchy bashes through oak thickets. Eventually you attain the southern rim of the canyon – open and mellow terrain. Lured by the thought of easy walking on pine duff I angled off the rim onto the canyon walls. This involved side-hilling long distances, a clear mistake. The wiser course, judging from the maps, would be to stay on the canyon rim as it drops towards the hogback. It isn’t clear to me if this descent route is any improvement over the line used for ascent. This trip includes miles of tough footing amidst vexatious vegetation. Wear boots. Between road-end and summit you gain 2600 feet in less than 3 miles. It is strenuous. Beginning hikers and the acrophobic want to look elsewhere. I expect that the lower terrain rattles in the warmer months. Watch where you place your hands and feet. Two liters of water was fine for a cool day but you’ll want some more to cover emergencies. In warm weather you will want much more. Stay off these ridges when thunderstorms threaten. There are fossils on the flanks of the hogback. The one pictured above might be a piece of coral. American Hiking offers a suggestion (PDF) for exploring the lower Ladrons without the navigation challenges and other hazards of climbing to the summit. The Albuquerque Journal has a brief article on the range. The summit gets described as challenging and they, too, suggest other destinations within the range. SummitPost describes the approach roads to this scramble, know that some of the signs they mention are no longer in place. In the “Climbers Log” link the commenters make frequent use of the word ‘rough’. The PeakBagger page has basic data on the range, but check the trip report by Phil Robinson. 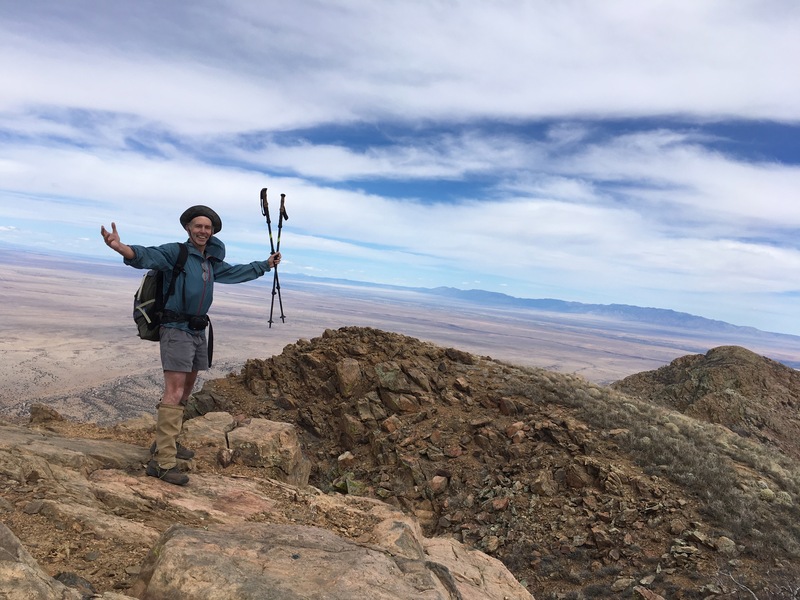 He provides a GPS track and adds a description of the traverse from Ladron Peak to the lower eastern peak. It sounds daunting. If I understand his report correctly then he followed the canyon bottom all the way to the ridge line, but on descent he pulled off the ridge and descended on a line similar to the the ascent described here. In the dark! Geocaching firmly notes the difficulties of this terrain. Additionally, they offer GPS coordinates for several of the turns on these unsigned county roads. Strawberry Peak is named for its resemblance, from some perspectives, to a downside-up strawberry. An outlier from the Socorro Mountains, it towers above the desert. The peak is eye candy for mountaineers driving south on Interstate-15. Don’t get distracted! Up close this is a very moderate mountain (7000 feet) that can be scrambled. The summit block gets a class two rating since few scramblers will feel any need for a rope. 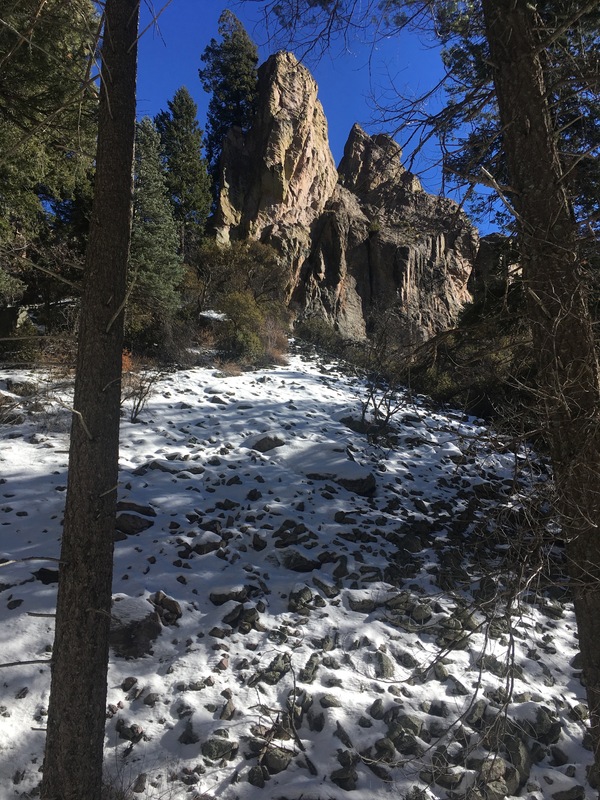 The approach is a long desert ramble launched from the floor of the Rio Grande basin, rising onto a broad bajada and chasing an arroyo to the base of the peak. A short and strenuous ascent brings you from base to summit. 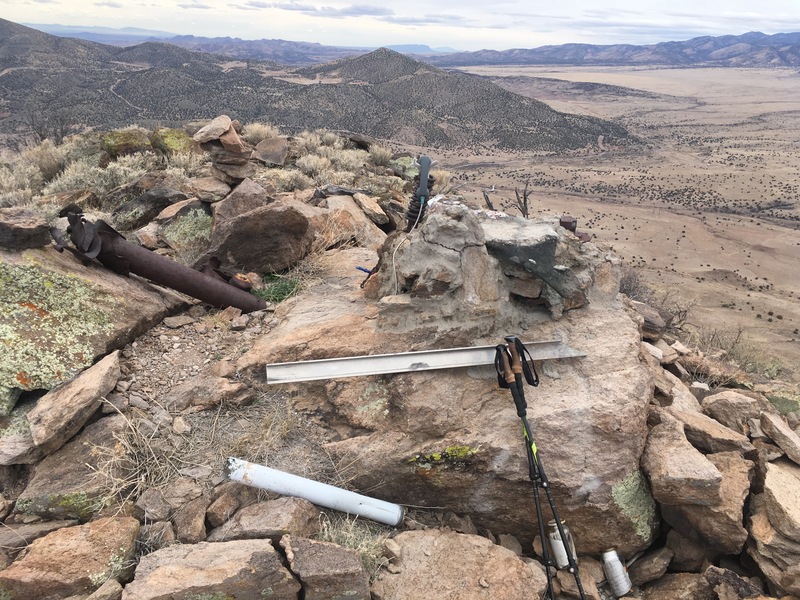 Land notes: the land immediately to the south of this hike belongs to the Energetic Materials Research and Testing Center (EMRTC) at New Mexico Tech. “Energetic material” means “explosive”. Unexploded ordinance lies scattered in that terrain and the EMRTC has a vigorous enforcement effort to keep people off the test grounds. Portions of this trail cross ranch property. The ranchers have been generous in allowing hikers, runners and bicycle riders to use their land. Keep yourself safe and keep the trail open by staying on the trail. From I-25 near Socorro, NM (driving either north or south) take exit 150 and follow the ramp system to where it joins California Street at an intersection with a stoplight. Reset your odometer. Proceed onto California St.
After 0.3 miles on California St, turn right onto Bullock St.
After 0.7 miles on Bullock St, at the third stop sign, come to an intersection with Lopezville Road. Continue straight ahead onto the New Mexico Institute of Mining and Technology where the road becomes Olive Dr (Olive Drive is not signed at the intersection). After 0.2 miles on Olive Dr, at a stop sign, turn right onto Canyon Rd. After 0.5 miles on Canyon Rd turn right onto East Road. After 1.1 miles on East Rd come to a gate. If the road is gated then park on the gravel pad before the gate. Otherwise, after 1.5 miles on East Rd come to a small, paved turnout on your left and park. At the 0.4 mile mark on East Road you will come to a stop sign at a four-way intersection. To stay on East Road you must turn right. In my short experience East Road been gated on weekends. If you come on a weekday you will save yourself a total of 0.8 miles of road-walking. There are no services at either the gravel pad before the East Road gate or at the paved pad at the formal trailhead. The popularity of this trailhead can cause parking overflows. You might try parking on the broad shoulders of East Road. Mesquite (that side-wall killer) grows at the shoulder margins. Have care for your tires. If you’ve parked at the gate then hike north on East Road for 0.4 miles. Look for the formal trailhead – a small paved pad on the west side of the road. 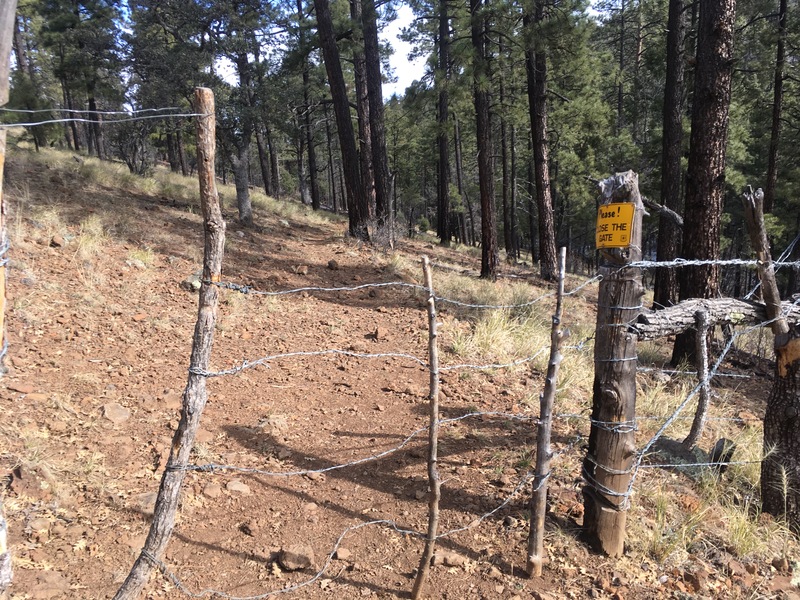 This unsigned trailhead offers a gate through a barbed wire fence. Close the gate after you go through and enter private ranch land. The trail meanders south and meets with another barbed wire fence in 100 yards. A high-stepping ladder surmounts this difficulty. This portion of the trail sees many bicyclists; expect the tread to have a U-shaped cross section holding tire-loosened rock. The Rio Grande runs past only a few miles away, but here you stand in the Chihuahuan desert. Creosote bush completely dominates the terrain. In warmer months you will want to watch for snakes. At 1.2 miles you will reach a power line. (All distances in this route description include the 0.4 mile road walk). Immediately before the power lines watch for a fork in the trail. Go right and follow the trail as it parallels the power line. At the top of a small rise the path swings to the west (to your left, heading in) and leaves civilization behind. Faint fork to the right? Take it! 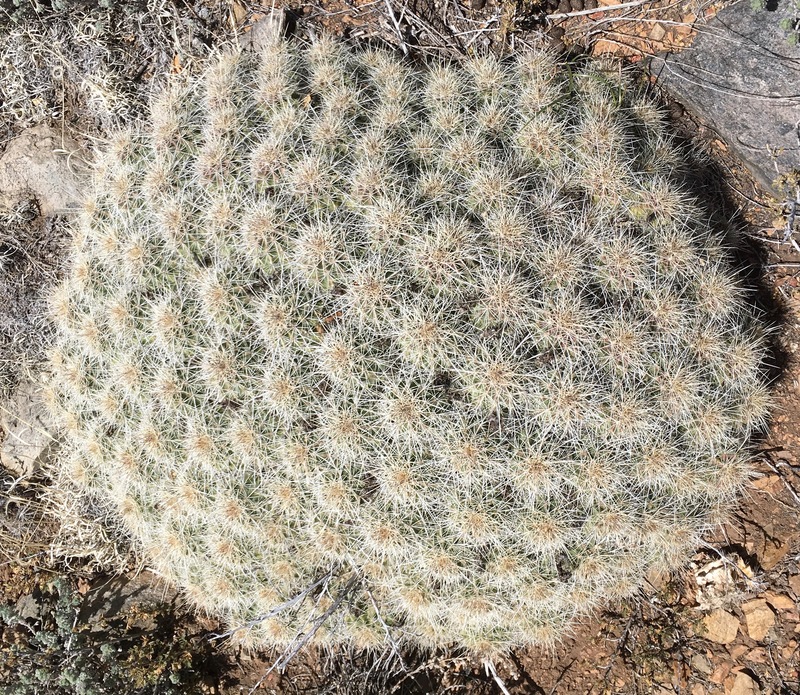 The tread heads towards a tiny conical hillock, denoted as point 4874 on USGS maps. The trail splits just before reaching this hillock. Like many, many other junctions on this trail there will be an obvious fork going south and a fainter fork going north. Here is the rule: always take the faint northerly route (go right, heading in). The trail swings around the hill and climbs a bit. From the hillock the trail drops into a wash and then climbs 80 to 100 feet onto a broad bajada. From the top be sure to look back. Views extend north to Polvadera Peak, northeast to Manzano Peak in the Manzanos Range, across the Rio Grande to the Quebrada hills, southeast to the dome of Carrizo Peak and south along the front of the Socorro Mountains, past the Chupedera hills and down to the distant San Andreas Mountains. Wind your way west, entering BLM lands, as the trail stretches across the mellow bajada. At 2.7 miles come to another junction with a prominent fork dropping south into an arroyo and a much fainter fork heading northwest. Remember: take the faint northerly track. The bajada portion of the hike ends at 3.8 miles. Nogal Arroyo appears off to your right and you must find a way down to the bed of the arroyo. The trail first drops into a small side-cut, rises on the far side, and quickly reaches the rim of the main arroyo. Finally, nosing west along the rim, the tread comes to a gully that drops briskly to the arroyo bed. If you look west along the arroyo you should see a windmill. Descend the gully on a cow path. (The arroyo rim trail continues past the top of the gully. If you find yourself pulling away from the main arroyo above another sidecut then you’ve missed the gully. Turn back). Follow the bottom of the Nogal Arroyo west. For several hundred yards you will be crossing private land. The windmill provides water for cattle and wildlife, please stay a good distance away. The arroyo bottom has long stretches of compacted sand interspersed with jumbles of basketball-sized boulders. Plates of a whitish and fibrous mineral, most likely a form of gypsum, are abundant. At 5.5 miles from the trailhead come to a confluence where the main arroyo bends to the south. Take the northerly fork. The map shows that I took the wrong fork and found myself trending further and further south. Piles of desk-sized boulders clog the south fork, you won’t find such piles elsewhere on this hike. On this date there were pools of water as well, but the salts precipitated next to the pools make drinking from them inadvisable. If you are worried about your course then you can scramble up the sides of the arroyo and look for the ruins of a rock house. If the ruins are north of you then you are off course. 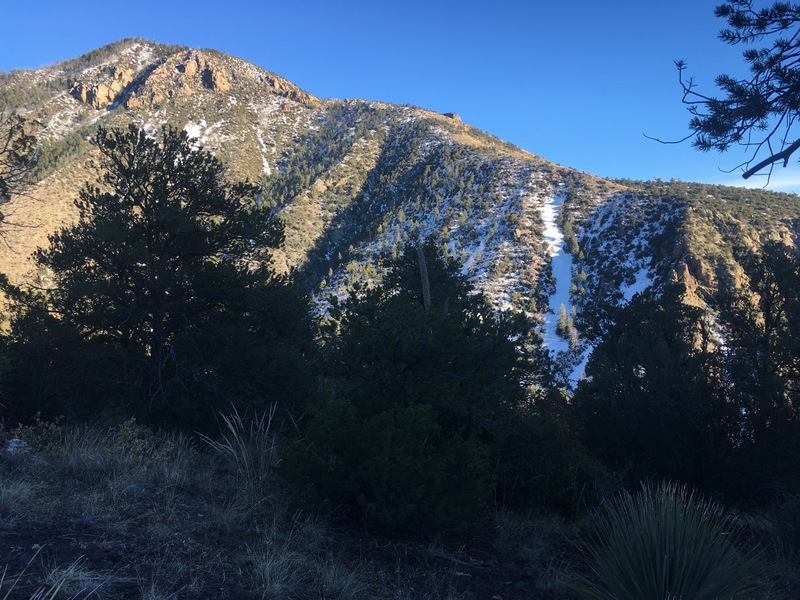 Best practice: stay close to the north side of the arroyo as you near Strawberry Peak – that will take you into the north fork and keep the Peak on your left. At 5.7 miles from the trailhead the terrain on the south side of the north fork (left on ascent) starts to rise. Watch that side for a big pile of loose rubble topped with a thick and slanted slab of cap rock. Just past this odd configuration a gully leads steeply up the foot of Strawberry Mountain. Leave the bed of Nogal Arroyo and ascend on the south side of the gully (left on ascent). After the initial steep pitch the angle mellows. Pick your way around juniper, prickly pear, and boulders towards a pair of cliff-fronted knolls. At the base of the knolls the terrain flattens to a narrow and grassy shelf. Cross the shelf and ascend between the knolls. A cattle path rising between the knolls offers solid footing. Past the knolls the terrain flattens dramatically in a wide shelf. Cattle love this place – every tuft of grass has been grazed to its roots. Watch your footing because tiny but prodigiously armed cacti lie scattered on this small plain. Cross to the base of a second pair of knolls and ascend the gully between them. Once again a cow path up this gully improves the footing considerably. Third shelf: lumpy. Look for the waterway to the left. Past these knolls the terrain forms a third shelf, distinctive for its numerous lumps and hollows. On this date I crossed these lumps directly toward Strawberry Peak. The footing on the next rise was not attractive. You may want to wind around the lumps going south and catch the waterway that rises to the fourth (and final) shelf. At the edge of the final shelf take a moment to study the scramble ahead of you. You will be ascending the southwest facing slope (the left-facing slope in the picture). Also, take note of where you are standing. The open shelf offers many options for descent, some of these options could make you very grumpy. When you know how to enter and how to leave then cross the shelf, contouring to the south (left on ascent), to attain a low shoulder. View of the Magdelana Mountains from summit. From the shoulder climb directly to the summit on steep, scree-covered terrain. The scree lasts for a rise of about 400 feet. At this point the surface becomes more rocky but maintains the steep pitch. After having ascended a total of 600 feet the angle mellows. The summit block has mild exposure, but the chief risk from a tumble comes from the belligerent vegetation. Arrive at the summit having travelled 7.7 miles. The summit houses offerings to space aliens and includes a phone for calling home. The views are grand. To the north lies the nearby Ladron Mountains, the semi-distant Manzano Mountains and Sandia Peak in the far Sandia Mountains. To the east find Carrizo Peak, the El Capitan Range and the north end of the White Mountains. The Socorro Mountains dominate the south. To the west, across La Jencia plain, find South Baldy amidst the entirety of the Magdelana Mountains. Sign the climbers log, phone home and return the way you came. The summit log has several entries from people who ran the entire length of this trail. I am impressed. Still, it would not be much fun to have your foot stabbed by the cacti and mesquite found here. More importantly, the ascent on loose scree begs for both foot protection and ankle reinforcement. Wear boots. Two liters of water was enough for an overcast, windy and cool autumn’s day. In warmer conditions you will need at least twice that amount. I treated this hike as a training exercise and took a full backpack. Mistake! The excess gear (together with some strong winds) threatened my stance on the steep-sided summit block. This tread rewards those who pack lightly. The land owners along this route deserve your thoughtful consideration. Pack out litter. Give any cattle you encounter as wide a berth as you can. The windmill is a working piece of ranch gear and you can avoid stressing the cattle by staying away from it. An valuable Summitpost entry gives due consideration to the possibility that you may end this hike in a secret CIA prison. An entry on Peakbagger provides the basic data on this hike. Take a look at the trip report by Thomas Denham for another GPS track and more recommendations on route decisions. 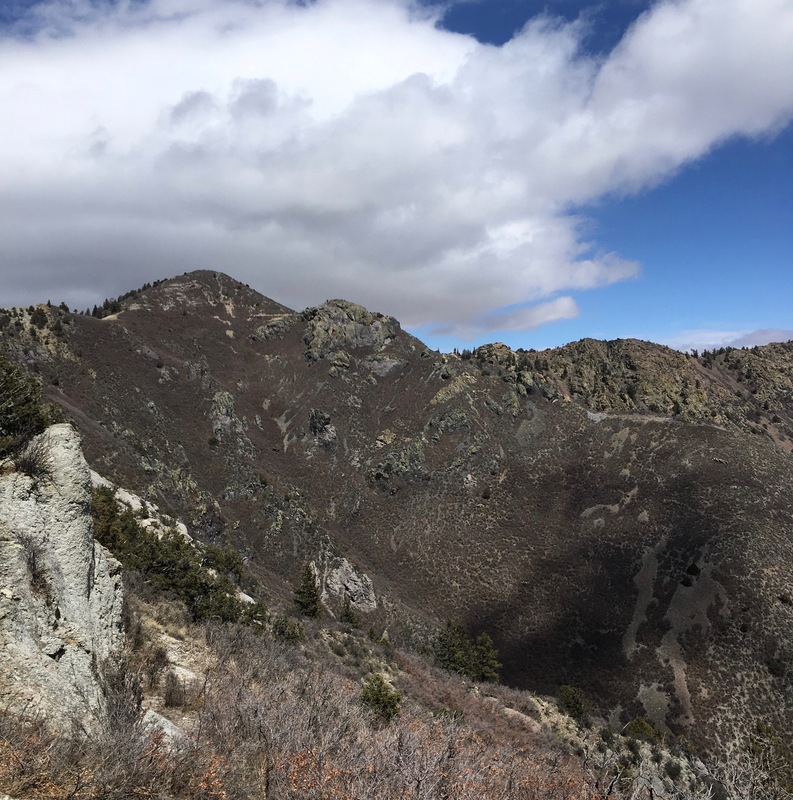 The Albuquerque Journal presents a useful list of suggested hikes for this region that includes Strawberry Peak, although that route description seems to have been taken from the SummitPost entry. A leg of the Continental Divide Trail once ridge-rambled east from Signboard Saddle, but the ridge burned and the tread is abandoned. Once uplifting, the terrain now supports only the lightest of positive spins. Bold regrowth, views down to shadowed canyons, views up to snowy ridges and stiff navigational challenges all find a home along the old trail. A raw helping of sadness and some danger also lurks inside this galaxy of tall and weakening snags. Elsewhere in the Black Range the 2013 Silver Fire produced a mosaic of burned patches and unscathed patches (see West Railroad Canyon). In contrast, the old CDT departs from Signboard Saddle, threads a few patchy burns, then marches into uncontested desolation. If you are a serious student of forest recoveries then this is the trail for you. Most hikers will want to give this trail some time. Green and great by 2029! In Silver City, from the intersection of US-180 and NM-90 (signed as Silver Blvd and Hudson Drive in town) turn onto US-180 East. After 7.6 miles on US-180 turn left onto NM-152. The junction is well signed. After 14.4 miles on NM-152 turn left onto NM-35. The junction is well signed. After 15.3 miles on NM-35 (past mile marker 15) turn right onto FR-150. There is a small, brown Forest Service road sign saying, “150”. After 7.8 miles on FR-150 veer right onto a gravel pad and, across the pad, onto an unsigned forest road. After 0.2 miles, in a flat meadow, park your car. 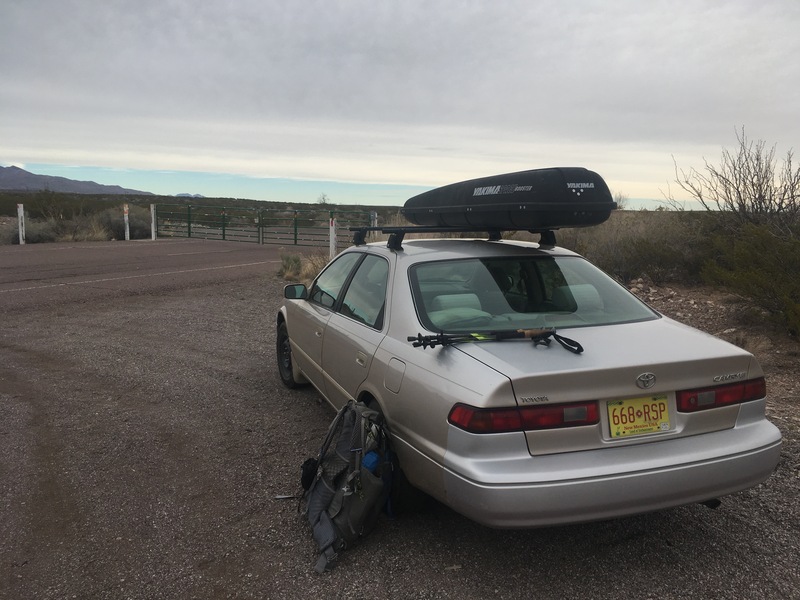 This leaves you 0.5 miles short of the trailhead, but for sedan drivers it represents a reasonable compromise between “getting there” and “never leaving”. Forest Road-150 is signed, “High Clearance Vehicles Recommended / No services 120 miles” and “Sharp Curves, Steep Grades, Trailers over 20 feet Not Advised”. 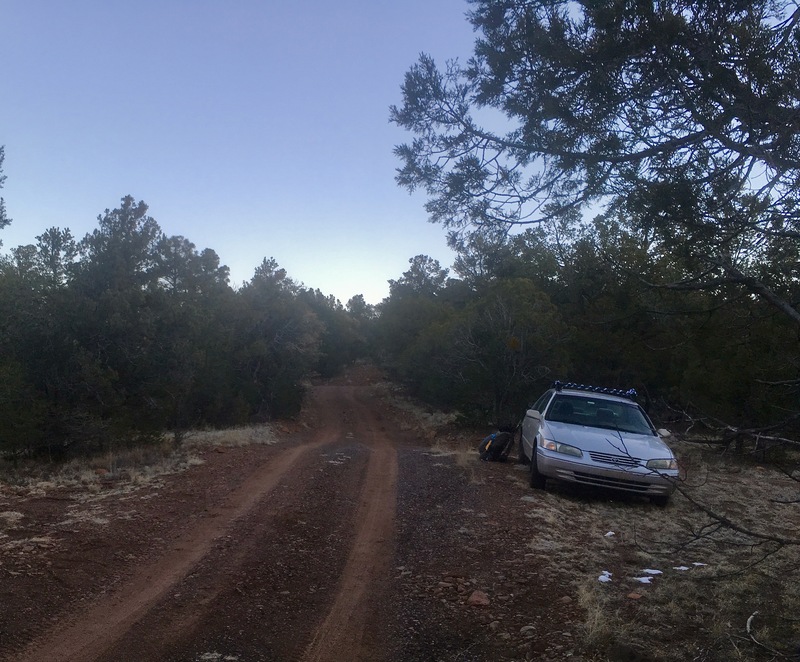 Also known as North Star Mesa Road or NM-61 or Wall Lake Road, this roadbed does have rough and narrow stretches. Drive undaunted because the first 7.8 miles contains nothing worse than a steep and washboarded initial incline. Wildlife abounds. Exercise deer diligence when the moon illuminates your travels. 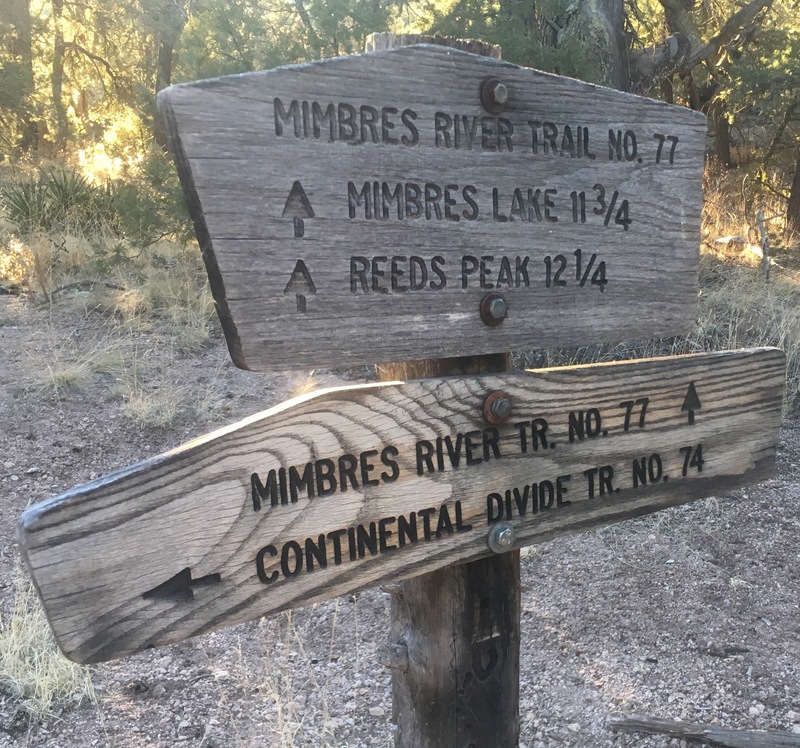 A Forest Service trail sign for “Mimbres River Trail #77 / Continental Divide Trail #74” stands where you veer off of FR-150. A regrettably similar sign stands at mile 7.3, just after the intersection between FR-150 and FR-150A. 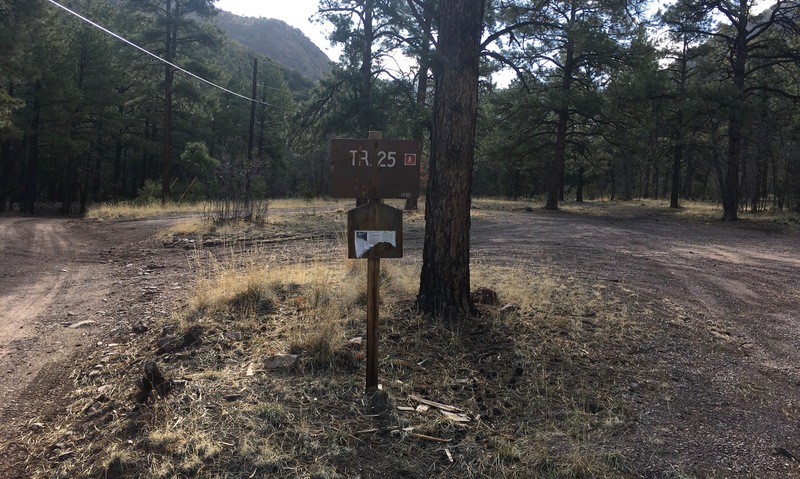 Skilled navigators will watch for the large gravel pad and the second Mimbres River/Continental Divide trail sign. A flat meadow served as the trailhead. The only services are an aging corral and a signpost at the end of the forest road. There is no water, vault toilet or trash service in either place. The signs at the start of the trail point to State Road 61, the Mimbres River Trail and the Continental Divide Trail. Note on the GPS track: The outward track does not begin at the meadow but rather at the end of the “unsigned forest road” (my mistake). The return portion of the GPS track shows the entire length of the trip. From the meadow stroll 0.5 miles to the corral and Forest Service signs at road’s end. One sign points to Signboard Saddle and asserts a distance of three and a quarter miles (a slight underestimate). Hike past this sign on a rock strewn two-track, which evolves into a single track on a gentle descent. 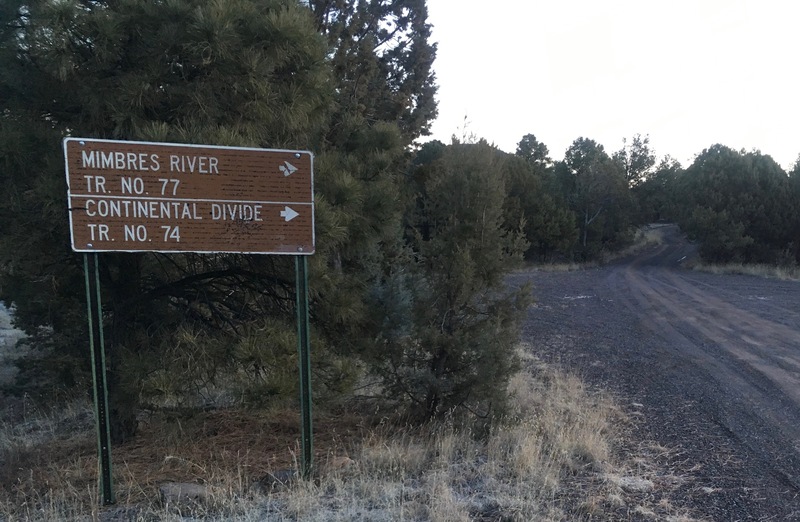 Reach the signed junction with the Mimbres River Trail at 0.9 miles. Go straight at the junction for the trail connecting to Signboard Saddle and the CDT. As the connector trail starts to rise you get glimpses of a forested dome ahead. Arrive at the dome’s base at 1.8 miles where the trail begins a short series of switchbacks. Keep looking over your shoulder – the southern view encompasses Tadpole Ridge and the Black Peak to Signal Peak ridge, with a purple glimpse of Mount Cooke. At the top of the switchbacks the path swings west and contours below the dome’s summit. New views open north to a vast bowl feeding into Rocky Canyon. Your path takes you east across a saddle and then bears north atop the bowl’s eastern rim. 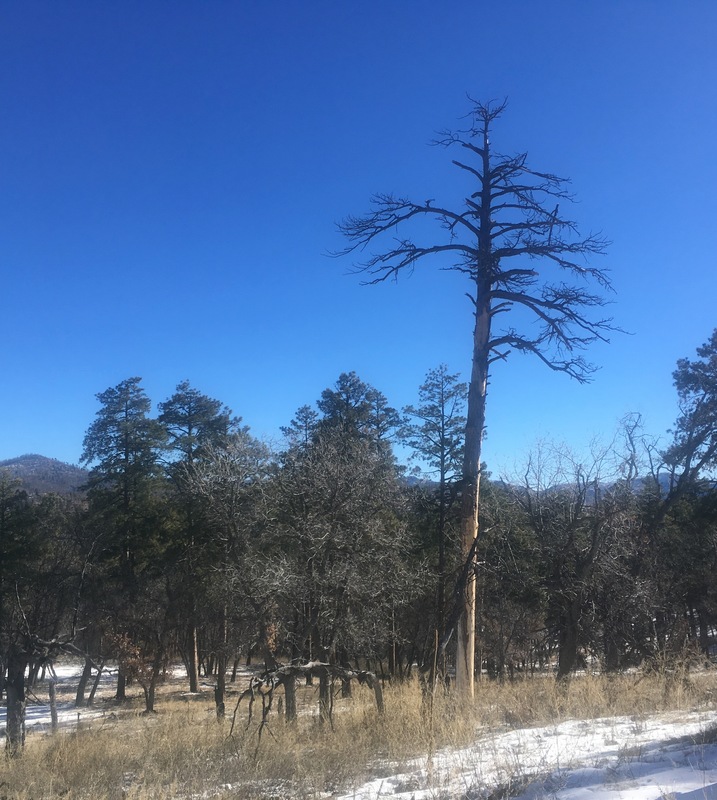 Pinyon and juniper, the lords of the lower trail, give way to ponderosa pines. To the east the slopes of the Black Range are a riot of darkling canyons. The trail drops gently off of the rim and barrels into the forested wonderland of Signboard Saddle at 3.7 miles. This spacious saddle houses a broad stand of tall Ponderosa. The canopy is dense, the forest floor is dark, yet the slanted morning sunlight glows warmly on cinnamon-hued trunks. The Silver Fire left the saddle singed but not roasted. Pine needles usually carpet the saddle, although crunchy old snow covered the ground on this date. The connector trail passes over the height of the saddle to intersect the CDT. On your left the CDT departs south to the Mexican border. Ahead a new leg of the CDT departs north to the Canadian border. On your right the old leg of the CDT (once the official northern branch) lies camouflaged by bracken, pine needles and seasonal snows. 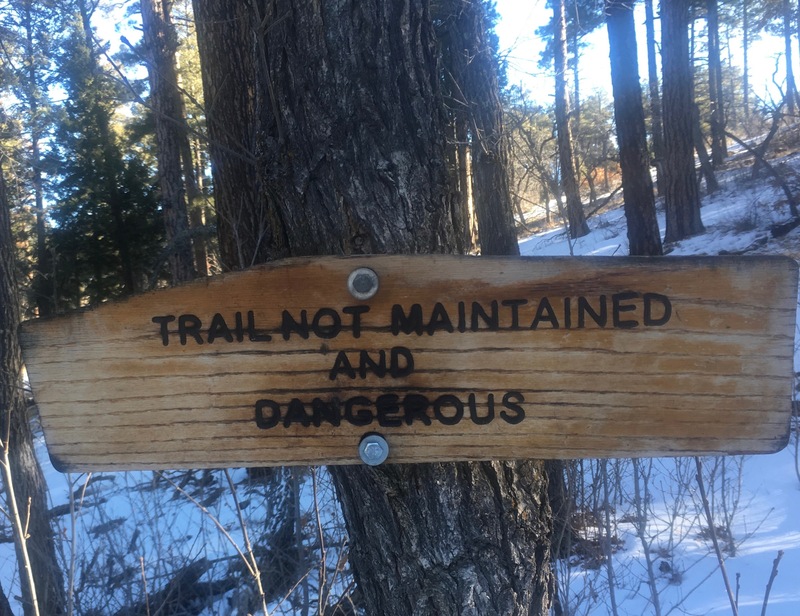 A wooden sign on the old trail says “not maintained, dangerous”. Concede the point gracefully if the winds are picking up. Got yourself a windless day? The old trail rises on the east flank of the saddle, tops on a spacious hillock and drops into an expansive headwater much like Signboard Saddle. These locations endured some flames but retain most of their big trees. The trail strives to stay on the 8400 foot contour, weaving out for each new ridge and weaving in for each new hollow. On the third outward weave the the fire’s stark effect becomes evident. Standing snags outnumber living trees. Even the tough mountain brush, grey oak and mountain mahogany, are spread thin. The forest floor seems unnaturally free of living obstacles. A singular shrub thrives, however. It often grows as a solo, waist-high shoot and is decorated with scimitars disguised as hefty thorns. The thorns attack synthetic fleece, giving high gaiters another reason to exist. Expect the tread to become intermittent. The path snakes below a much abused barbed wire fence. If you lose the path try following along the fence. At 4.9 miles the trail comes close a saddle top. 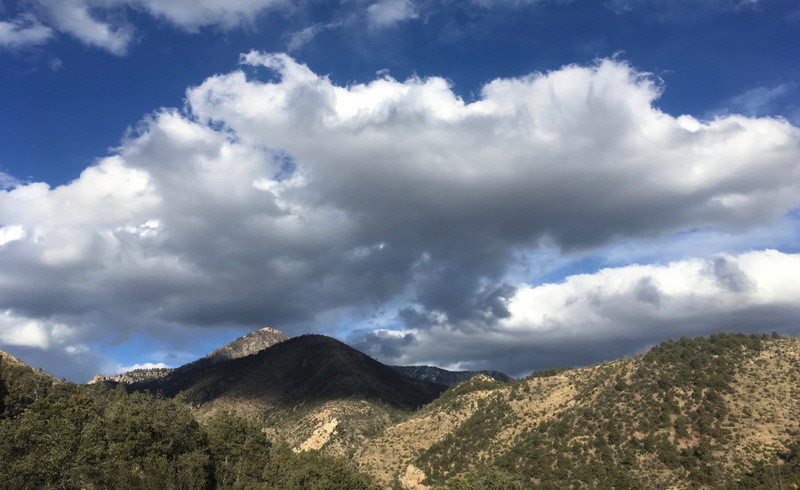 Go briefly off-trail for views to cliffs, canyons, mesas and alluvial fans that grace these mountains. 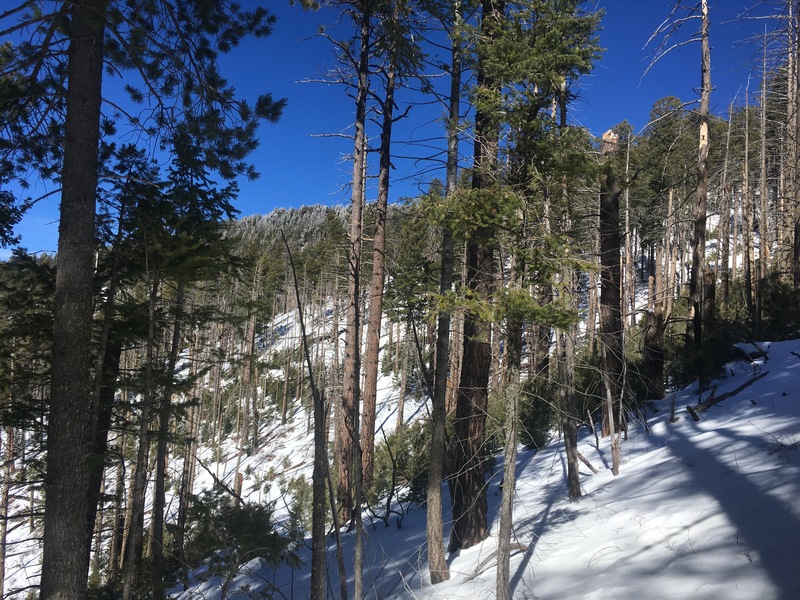 The forest that once adorned these slopes is gone; leaving plain a story spoken in rock and snow beginning on the Black Range ridge, coursing to its middle in a confusion of canyons and ending on the Mimbres River. Round the next rib and enter a hollow at 5.2 miles. Here navigation-by-trail becomes wishful thinking augmented by misplaced trust. Deadfall occludes the trail. A slow motion landslide afflicts these ridgeside soils, tossing stones and piling debris onto the trail. Part of this tread has twisted into alignment with the hillside. A line of tall grass tufts marks the tread’s rolled remains like a vegetative gravestone rubbing. The main ridge stays visible above you and offers some guidance. Watch for several high ribs that strike north into the Aspen Canyon bowl. If you find yourself on a prolonged northerly descent you’ve mistaken a rib for the ridge. (The excursion north shown on the map at mile 6.2 was just such a mistake). Finished with wiggling east, the trail begins a northeasterly trend. There is a switchback at 5.8 miles. It may be obvious in warmer conditions but it was easy to miss on this date. Beyond the switchback is a steep swale, so when your thoughts turn to, “that really doesn’t look right”, then scan uphill for the broken fence line. Weaving out on the next rib you encounter a heartening grove of ponderosa saplings. Perhaps the fire was less intense here, allowing the seeds to survive. Aboreal armageddon visited the next hollow, where ranks of bleaching snags scorn any thought of swift recovery. The snags themselves are enormous. Fifty-foot high and fire-sculpted tree trunks have braved six years of mountain weather in a peculiar display of post-mortem toughness. Be amazed, unless the trail goes near one of these widow makers. Then, be quick. At 6.6 miles the main ridge hits a shoulder where the tread drops 100 feet. The shoulder’s north face supports a bastion of thorn bushes. The trail disappears. Hack through this bastion and arrive on another saddle, warmed by the midday sun and snowmelt soaked. The glide of these squishy soils into the canyons seems palpable under foot. Push past deadfall on the far side of the saddle and regain the trail where it rises along the west face of the ridge. Rounding a knoll at 7.3 miles the trail turns back east. The views, grim and magnificent, cross the Aspen Canyon headwaters to the charred summit of Aspen Peak. Take a seat on a sun-bleached log, take a pull on your water bottle, take out the lunch fixings and take in the view. Fast hikers could continue all the way to Aspen Peak. Out of time? Return the way you came in. Avoid windy days. Gain an edge by scouting your favorite forecast website for a block of two or three windless days. Question why you would pick this particular hike. I do want to revisit this corner of the Aldo Leopold Wilderness, pending a decade exploring elsewhere. On this date the snow rose as far as my boot tops, obscuring enough of the tread that I made frequent map and GPS checks. Go when the snow is gone to ease navigation. That said, grass grows in long stretches of the trail, deadfall lies in heaps and broken tree limbs mat over the tread many inches deep. Novice navigators need another destination. Two liters of water was plenty, despite a balmy 45 degrees on the ridge lines. In warmer (but still windless!) weather the absence of shade will factor into water considerations. The Forest Service refers to this trail as the Aspen Mountain Trail in its list of “Trails Not Recommended”. They make special mention of the New Mexico Locust (described above as “decorated with scimitars”) in concluding that this trail is impassable. That’s all that I could get out of Google. 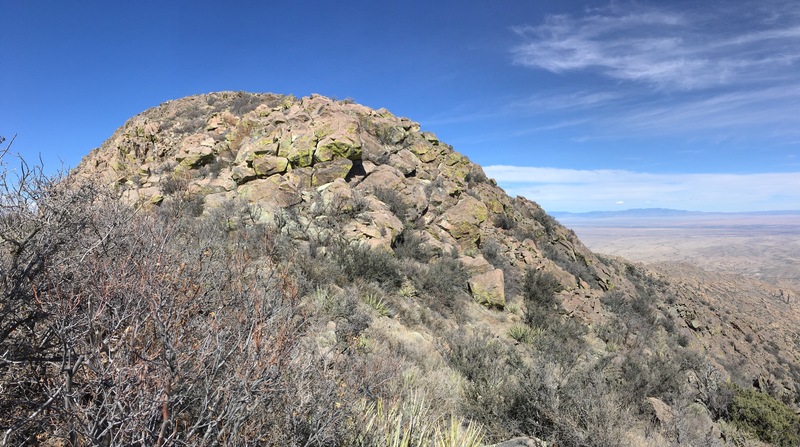 The vast majority of “hits” were thru-hiker blogs describing the Black-Range/Gila-River alternative routes and why they (invariably) chose the Gila. Please leave a comment if you’ve know of other links. 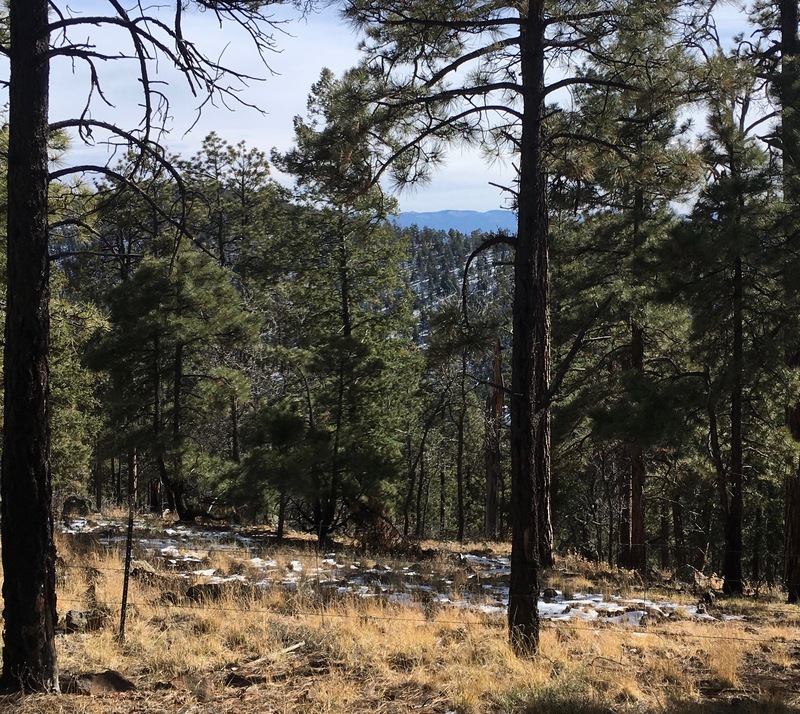 The Holt-Apache Trail, #181, takes you up the west-facing slopes of the Mogollon Mountains to a view point on the summit block of Holt Mountain. A history of wind and fire has resulted a thin patch of snags that opens to terrific views across the Dry Creeks region of the Mogollons. My turn-back time had arrived so this report does not describe the trail where it ascends the last few hundred feet to the summit of Holt Peak. On a longer day that should be easy to do. 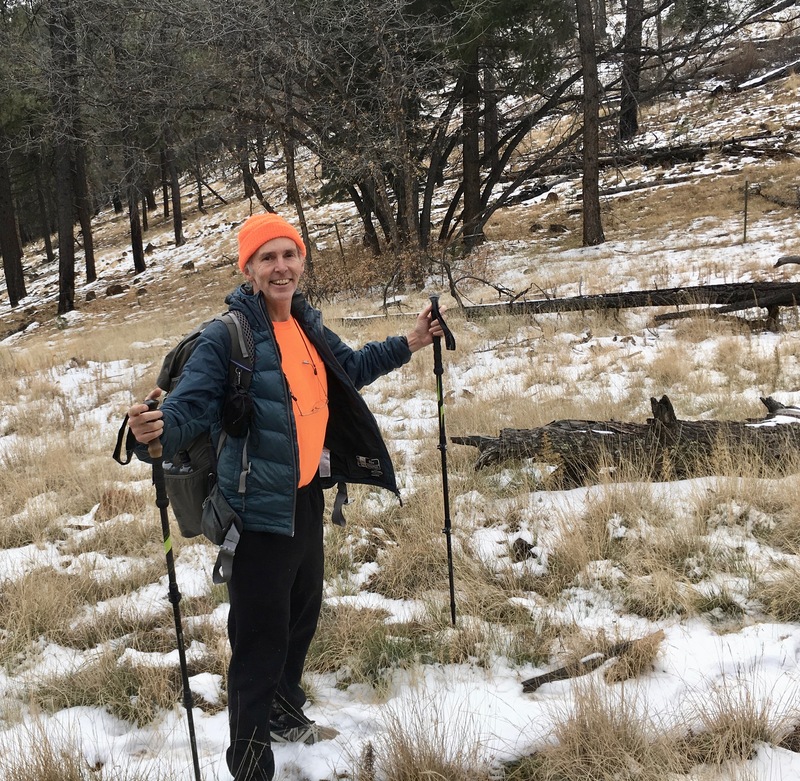 It might be even more rewarding to continue along the Apache-Holt trail for another half mile while searching for views down Whitewater Creek and into the heart of the Gila Wilderness. The trail is moderately steep, clinging to canyon bottoms in the first stretch and then mounting well-engineered switchbacks to bring you up out of the canyon. Unfortunately, the trail is being abandoned by the Forest Service. You are needed! Hike this trail and your very tracks will assist in keeping this gorgeous national resource open. From US-180 and NM-90 in Silver City, NM, go west onto US-180. After 53.7 miles on US-180 go right onto Sheridan Corral Rd (gravel). The road is officially signed CO54, but there is an informal sign attached to a fence saying “Sheridan Corral”. Sheridan Corral Road is currently in good shape. All the maps I’ve seen depict a loop at the end of Sheridan Corral Road. That loop may exist, but it looks as if it might only be accessible to ATV drivers. If you are driving a truck or car then the end of the road is a smallish gravel pad in front of a weathered trailhead kiosk. I suspect that horse-folk use this trail. Please leave the gravel pad open so that those dragging a horse trailer can turn about. There is a gravel pull-out beside the road just before the pad. You can park in that pull-out. The trailhead is just a gravel pad and kiosk. There is no trash, vault toilet or water service. You should not count on water running in the canyon (bring your own). There are picnic tables and vault toilets in the Aldo Leopold Vista on US-180, near mile marker 63 (just a few miles south of Sheridan Corral Road). A sign near the start of the trail says that the trail is no longer maintained and that it may be hard to find in places. That last warning is not currently warranted. Finding the trail was straight forward, even when the tread was buried in a half foot of snow. There is an apparent trail junction right behind the trailhead kiosk. Veering off to the east (to your right, looking uphill) lies a two-track. 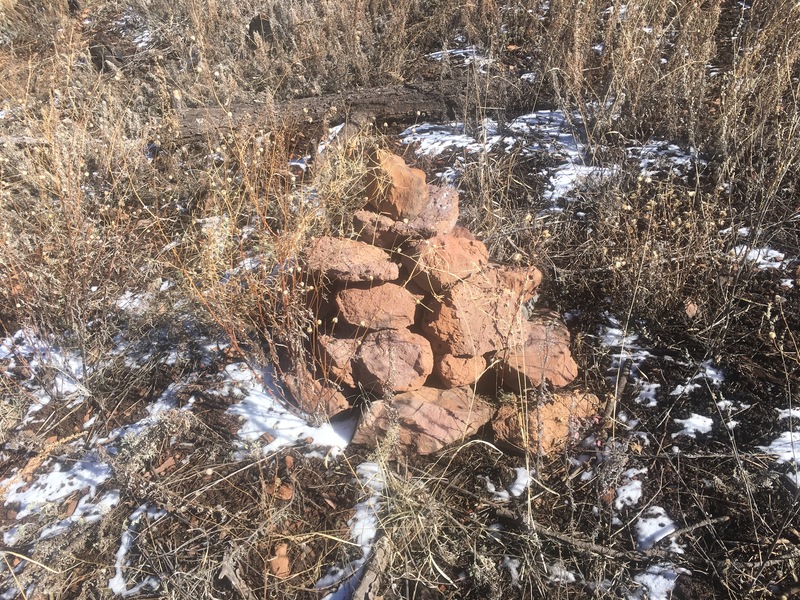 This may be part of the old loop that once graced the end of Sheridan Mountain Road. You will want to bear northeast (to your left looking uphill). That will take you past a bright yellow warning sign saying that the trail is abandoned and may be hard to find. The trail ascends for a short ways, gaining the top of the ridge between Sheridan Corral Creek and the unnamed canyon to the north. On the ridge the trail meanders back and forth until you enter the Gila Wilderness at 0.6 miles from the trailhead. The signage for the Wilderness boundary is falling to pieces. Past the signs the trail begins a short drop to the canyon bottom. The tread rounds a broad buttress and views open to Sheridan Peak on the east side of the canyon. Above you, on the west side, is much evidence of the Whitewater Baldy Complex fire of 2012. It must have burned hot. Even now, seven years on, the hillside is covered with patchy grass and a strikingly sparse scattering of gray oak. The fire damage extends all the way to the canyon bottom. This region, protected from winds by canyon walls, is a continuous display of shriveled firs and blackened pines. On this day the creek in the bottom of the canyon was roaring away, displaying a gray-green coloration from the sand and clay it was hauling down from the heights. (There had been recent rain and snow storms). 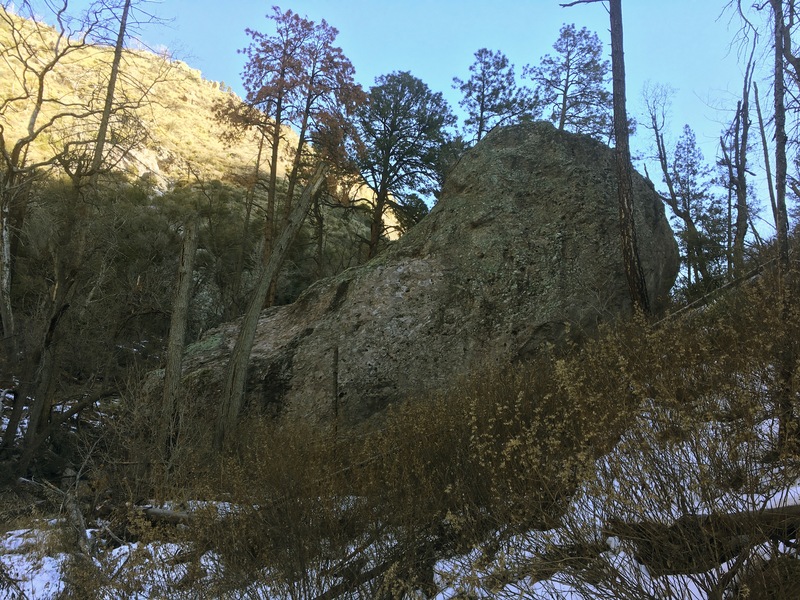 As you continue upstream you will encounter a monumental boulder in the canyon bottom, at 1.5 miles from the trailhead. This boulder may have once been a fin of rock that then wore into a hoodoo, then into a “hanging rock” and then losing to gravity to become a “settling rock”. The trail twists back and forth across the creek while ascending at a gentle rate. As you pass the boulder you may notice that the fire devastation has eased. Huge old ponderosa and Doug Firs are present, sometimes blackened around their bases but still thriving. At 2.0 miles the trail enters a level, meadowy stretch and comes to a signed junction. The North Fork Big Dry Creek Trail #225 departs to the right. Veer slightly left to stay on the Apache-Holt Trail. Both of the canyon rims lower as you ascend. The canyon walls open broadly to the sky. The creek bottom is warmer and brighter. The canyon is still quite dramatic, as the rim features tall hoodoos, fins and crown-shaped outcrops. Apparently this segment escaped the fire entirely. The understory includes a particularly clingy form of bramble that can slow your progress considerably. It was a good idea to have gaiters just to deal with the brambles. On this date footprints in the snow showed the passage of both deer and elk. At 3.4 miles the trail leaves the bottom of the canyon and begins a series of carefully constructed switchbacks. The trail builders have thrown long rock walls to shore up the downside of the trail wherever needed. Scratch your head and ask how it is possible that such an investment could possibly be abandoned. The slope above the trail is steep in places. In wintertime you may see snow pinwheels (also known as “death cookies”) scattered along the hillside. These are thought to be evidence of unstable conditions. Exercise some thought before crossing any snow-choked chutes. Up and up and up! Although really it is only a half mile of switchbacks before the trail lurches to your right and makes a long, flat contour to the east. A mosaic of all-green patches and all-burned patches arise at this level, with the burned patches providing you with views back down the canyon. The trail eventually reaches a rib-top and turns uphill to follow the rib towards the high ridgeline. Views of Holt Peak can be seen filtered through the evergreens. This is a gorgeous ramble through dense Douglas firs. 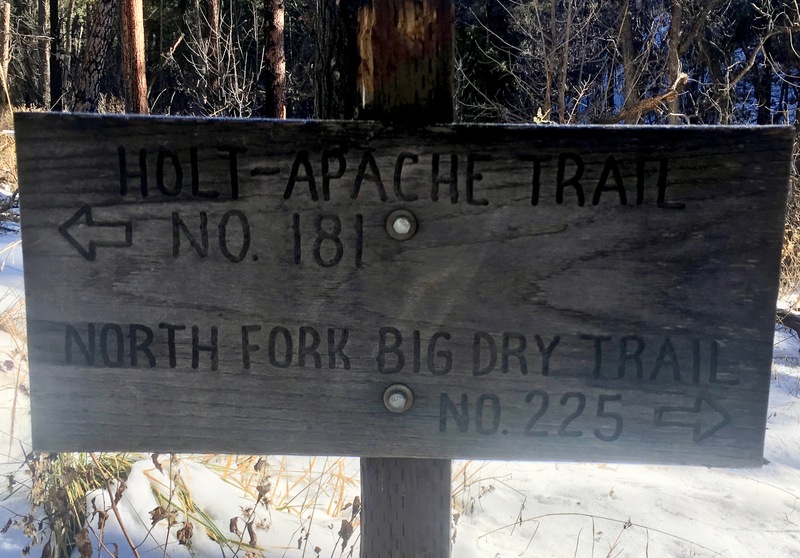 The snow began to accumulate (on this date) and the junction of the Apache-Holt trail with Holt Gulch Trail #217 was obscured. Fortunately there was enough trail evidence (such as sawn logs or water bars) poking through the snow that the main trail could be followed to the ridge. The trail slowly climbs to the main ridge line. When you reach the ridge it is worth turning north, off trail, and ascending towards Holt Peak for another hundred feet through open forest. You will find a stark, nearly snag-free burn with views swinging from the east down to the southwest. Looking across both the Big Dry Creek and Little Dry Creek drainages you will see Black Mountain and Sacaton Mountain, with Mogollon Baldy peeking over the ridge between them. You have almost innumerable options at this point. If you have enough daylight hours then the summit of Holt Peak is immediately above you. Energetic campers will want to continue along the Holt-Apache trail into the Mogollon’s high country. Time-limited day hikers, however, will probably want to soak in the sights and return the way they came. As with other hikes in the Mogollon Mountains, dedicating just a single day to this hike is going to be frustrating. There is so much you won’t get to see! From my turn-back point it would be only 4.6 more miles to Spider Saddle. From the saddle a range of summits becomes accessible. These include Grouse Mountain, Indian Peak, Black Mountain, Center Baldy, Whitewater Baldy, Willow Mountain and many others. If you have the time then treat this hike as just the approach-leg for an extended stay. Haven’t got a free weekend? Then just do this hike! The canyon is beautiful and the views at the top are great. Plus, this trail (like many others in the Gila) badly needs greater boot-sole solace. Your efforts here will help to keep open a hiking gem. I went through one and a half liters of water on a warm (50 degree) winter’s day. That was plenty. 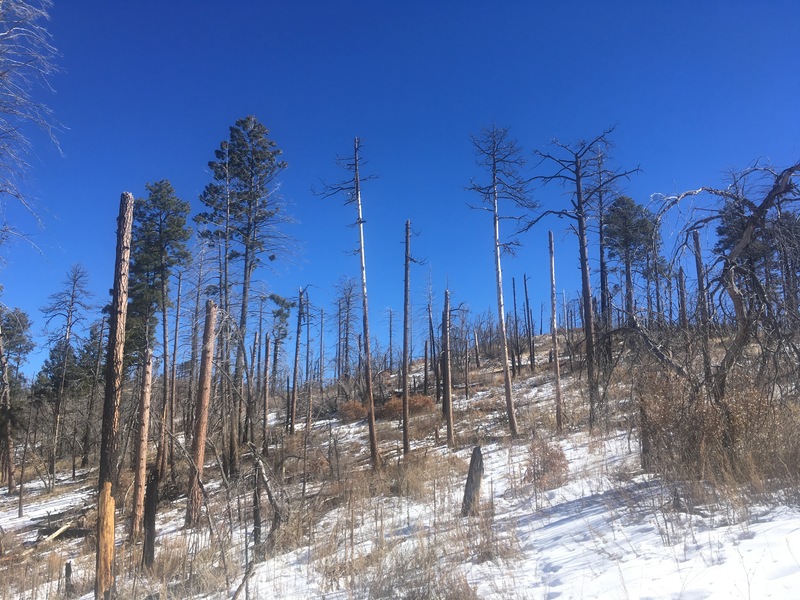 If your own trip is planned for the truly warm months, however, then factor in the effects returning through burned areas (with little shade) in a southwest-facing canyon. The rush of water described in this report was strongly influenced by a recent snow storm and a subsequent rain storm. The canyon bed is likely to be dry in the pre-monsoon season. Consult the weather reports before going on this hike. The remaining snags are aging fast and wind will eventually topple them all. In recent years the snow pack has been terribly light and avalanche concerns have been almost negligible. That said, do watch for patterns of storms that might suddenly increase the risk. There are chutes here that raise your wintertime risk-levels. I heard just one sharp sound that may have been gun fire. 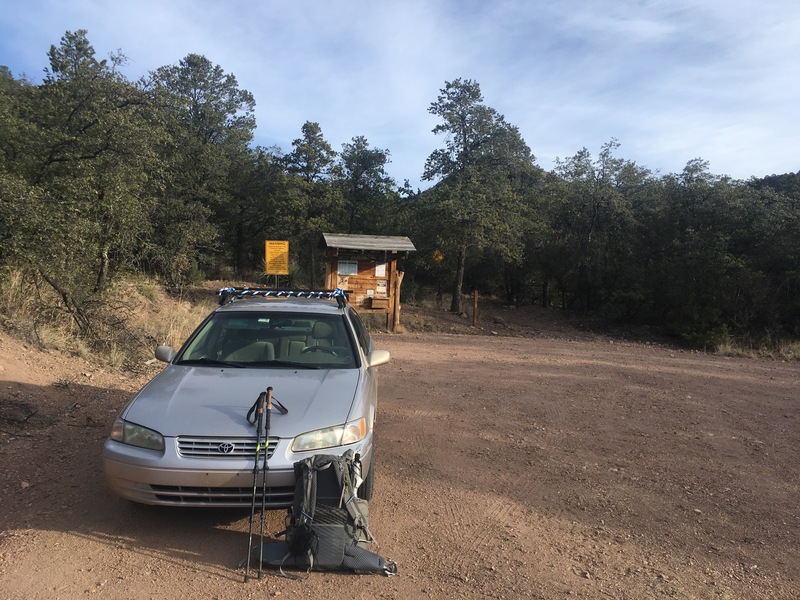 The Gila Wilderness does open for hunting. A National Park Service report (undated) says that turkey season is late April and early May. Deer and elk season for bow hunters is the first three weeks of September, while deer and elk season for rifle hunters is October and November. Bear and cougar season is December and January. An orange wardrobe will continue to be useful for at least another couple weeks. There is a detailed route description from 2016 (i.e. post fire) at HikeArizona. Closures and other official information can be found at the Forest Service site. 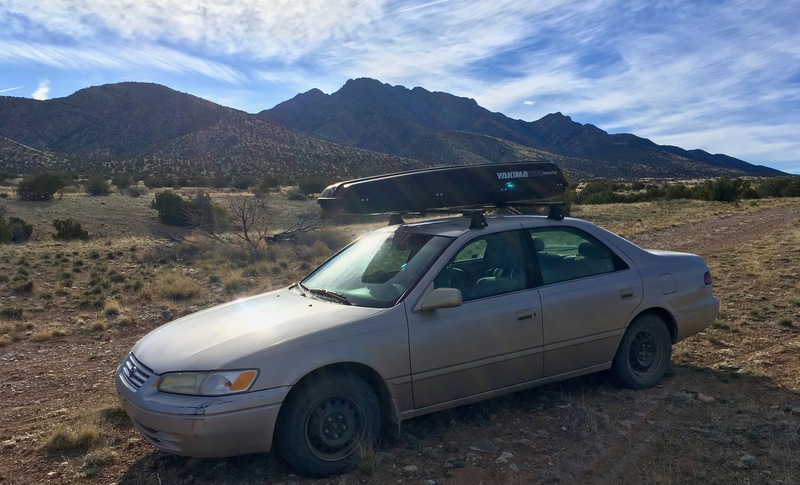 “Stav Is Lost” has a trip report that describes a foggy-day approach in wintertime New Mexico. 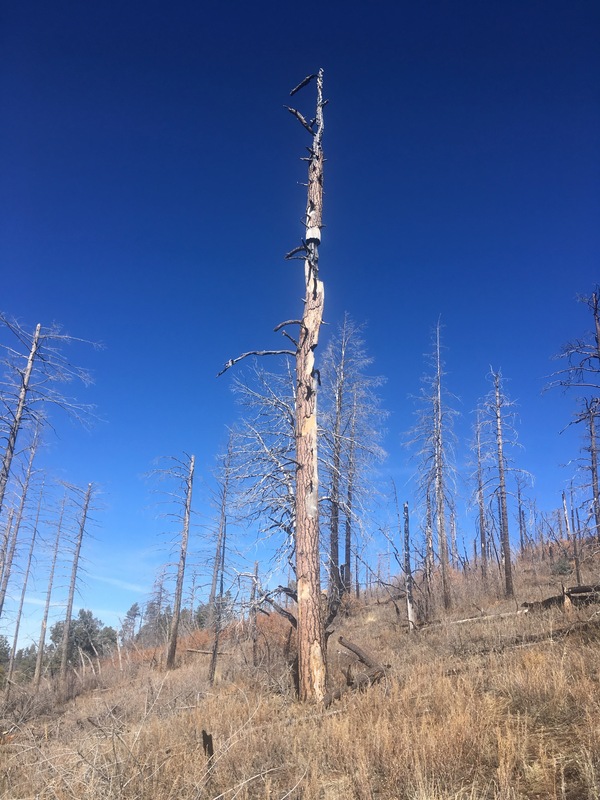 The photos will give you a good idea of what you are heading into, with emphasis on how the 2012 Whitewater Baldy Complex fire took a big toll on this part of the world. 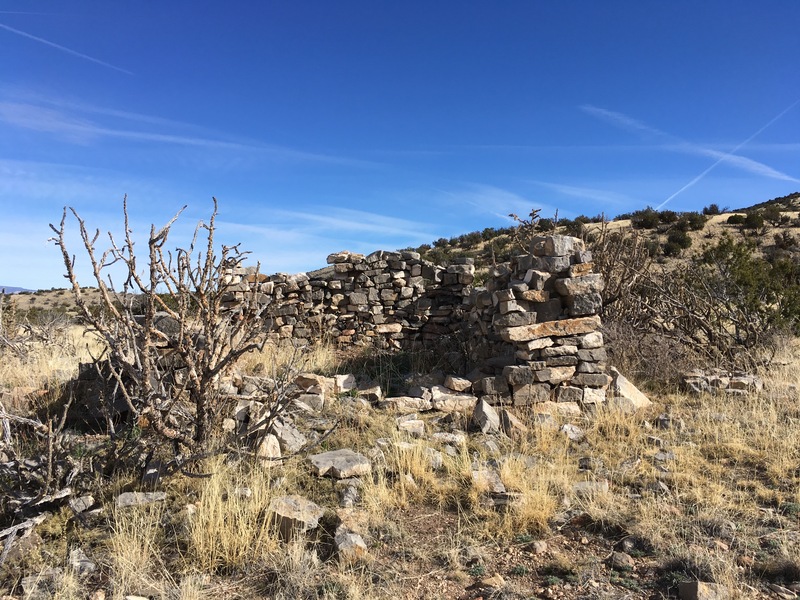 The Casitas de Gila page has a 2015 trip report, but one that only extends for the first 1.5 miles of the hike. The geological discussion at the end is very interesting. They also recommend picking a calm day. This is a splendid trail. It wanders more than three miles along a creek that currently enjoys a pleasant run of water. The “creek” is flanked with enormous canyon walls. 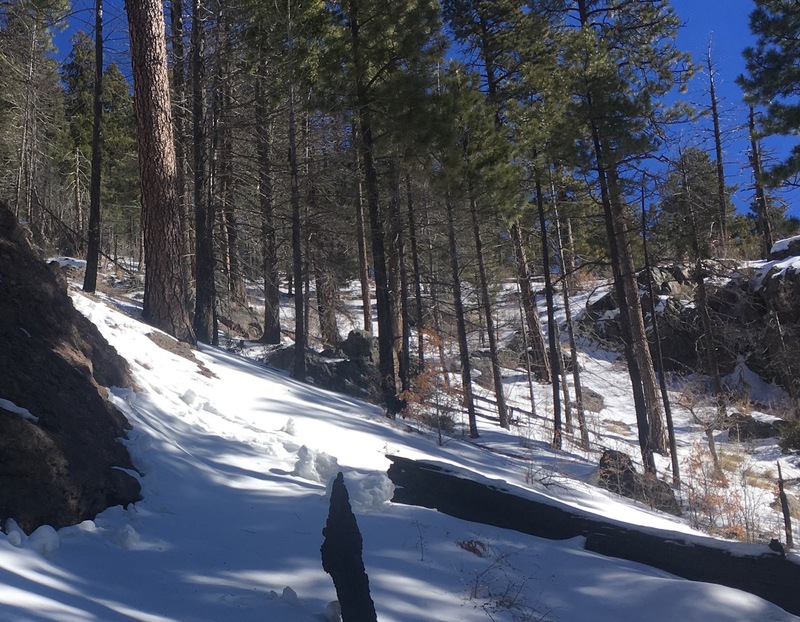 Eventually the trail leaves the canyon bottom and offers you a brisk, mile-long ascent onto a high ridge line in the Mogollon Mountains. The trailhead is easy to access. Views, wildlife and solitude abound. In fact, that solitude may be a bit too abundant. Forest Trail #180 is in painful need of hiker affection. In its upper reaches there is some deadfall to clamber across. In places the trail is slowly rolling back into conformation with the hillside. Tufts of grass grow in the tread and brush is starting to encroach at knee level. You are needed! 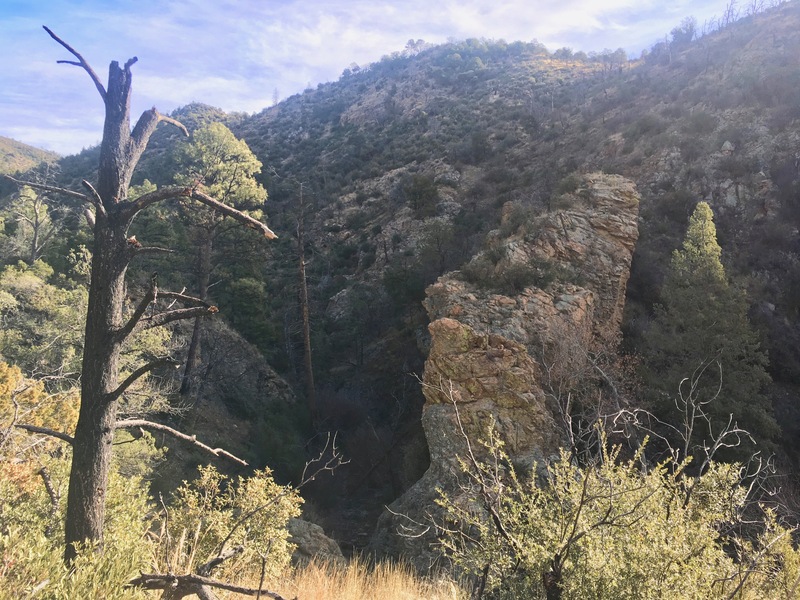 Get out there and show some boot-sole sympathy for this great diversion into the Gila National Forest. The Mogollons are magnificent and your hike will maintain access to this high terrain. 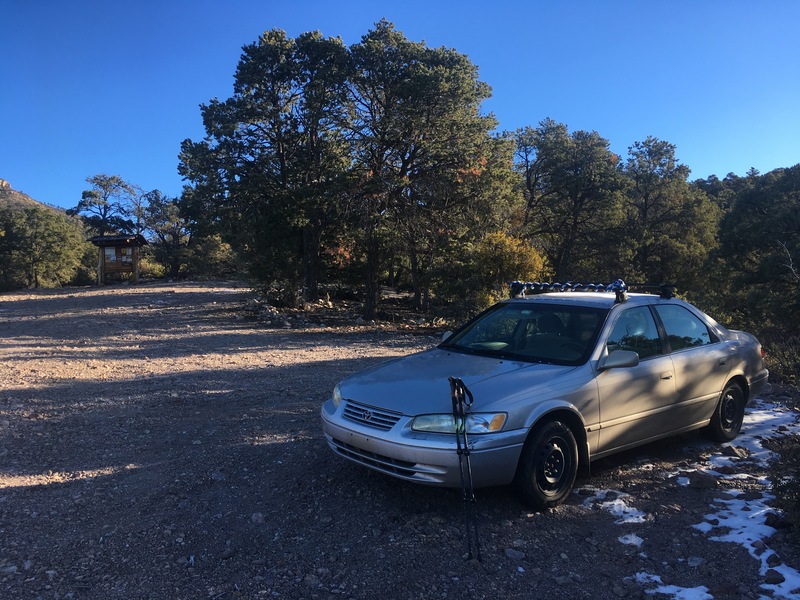 In Silver City, NM set your odometer to zero at the intersection of US-180 (signed as “Silver Heights Blvd”) and NM-90 (signed as “Hudson Street”) and go west on US-180. After 50.5 miles, past mile marker 63 and immediately past the signed bridge over Little Dry Creek, turn right onto Sacaton Road (gravel, well signed). After 2.8 miles, at a T-intersection, turn left onto Forest Road 196 (signed as “196”), also known as Little Dry Creek Road. After 3.3 miles, at the road end, park at the trailhead. 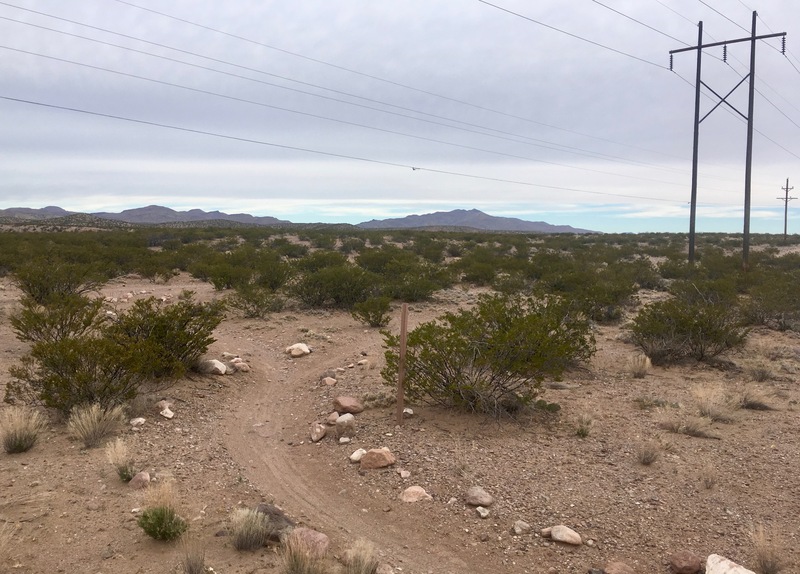 Sacaton Road has been recently graded and is in very good condition. FR-196 is also in good condition. There was no problem with using a sedan to get to the trailhead. The trailhead is a turn-about at the end of FR-196. There is a kiosk and a yellow warning sign to let you know that recent fires have created certain risks along the trail. There is no water, no trash receptacles nor vault toilets. 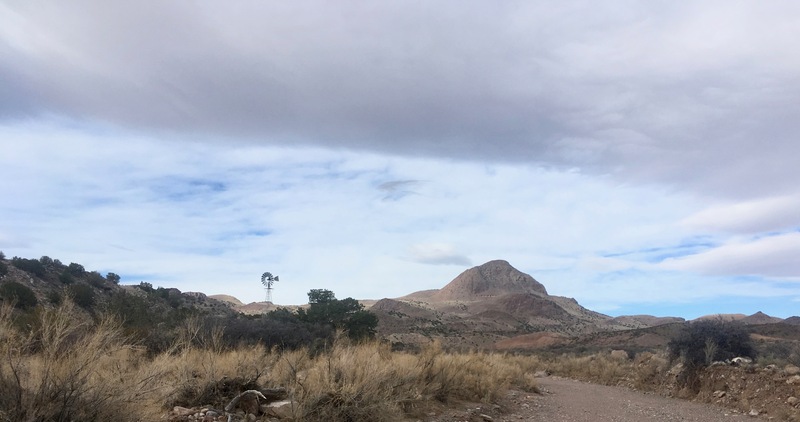 If you are coming from Silver City then the Aldo Leopold Vista on the west side of US-180 (0.6 miles before the Sacaton turn) provides both vistas and vault toilets. When parking at the trailhead please leave space so that folks pulling horse trailers can maneuver. The lower stretch of Little Dry Creek Canyon has been described previously on this blog. For greater narrative detail you can link to that description here. This post will simply show some landmarks along that mellow tread, and then resume a narrative of the hike when the trail leaves the canyon bottom. From the trailhead, climb briefly on a rock-riddled two-track and arrive at a height of land with wonderful views of the canyon. The trail then descends to the canyon bed. At 0.9 miles from the trailhead come to a deep cut where Little Dry Creek has sawed into a fin of rock. The trail rises on the west side (to your left on ascent) to get around this fin. Continuing upstream, the trail hop-scotches the stream bed and arrives at a second fin (with a short detour to a pretty waterfall) at 1.4 miles. In the early morning most of the light in the canyon bed has been reflected off of the western walls of the canyon. At 1.5 miles you will pass a faucet strangely stranded in the middle of the woods. Water pressure must be good, since it was dripping briskly on this date. The rationale for this faucet arrives at 2.1 miles where an abandoned cabin stands. As always, be careful around abandoned buildings in New Mexico. Hanta virus is a genuine threat and those sagging walls don’t look any too sturdy. At 2.7 miles come to a small meadow that extends to the west from the stream. Take note of the trail junction in this meadow. On your return you will want to bear to your left at this junction and stay near the bed of Little Dry Creek. Looking ahead you will see a tremendous canyon wall dropping down on the east side of the creek. As you enter this part of the creek steep walls on the west side come down to create a strikingly pinched passage. This is close to being a slot canyon – although the walls are not quite vertical. Another hard rock intrusion at 3.3 miles forces the trail to rise about 30 feet into a side cut. Visible high above you in the side cut is a towering hoodoo. At 3.6 miles come to a raised shelf on the west side of Little Dry Creek. This would make a good camping spot that already contains a substantial fire ring. 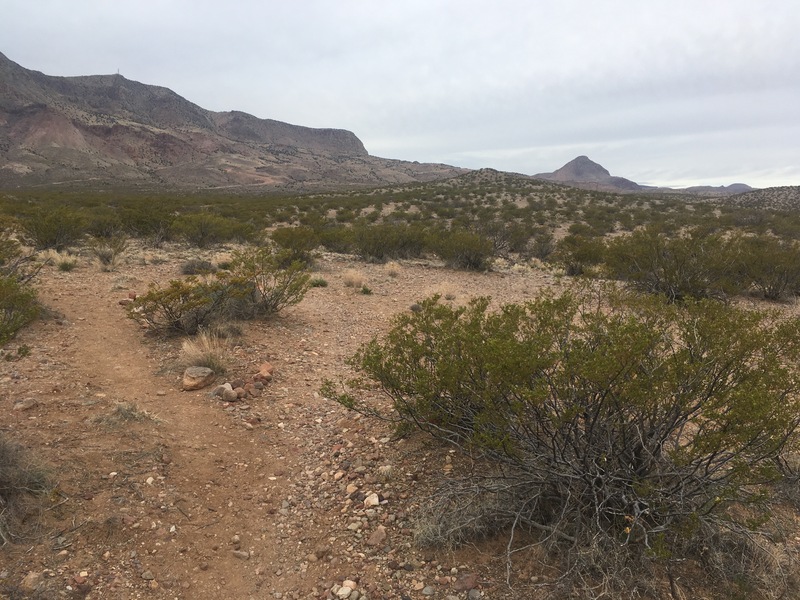 The previous post on Little Dry Creek describes a departure from the trail from this spot to follow Little Dry Creek as it reaches up towards Packsaddle Canyon. To reach Windy Gap you should scout the canyon wall above the fire ring and you will find the tread as it snakes around deadfall and past Douglas fir into higher and colder terrain. The trail now has a spirited go at gaining altitude. No more Mr. Mellow Fellow. Passing through small stands of fir separated by brush-filled terrain, the ascent provides unsettling views into the fire-decimated upper reaches of Little Dry Creek. You will note a change in the quality of the trail as well. In places the path is strewn with branches or rocky debris. In other places the tread is drifting downslope, so that you have to angle your ankles to get a good grip on the side of the mountain. More boots are needed to keep this trail open! At 3.9 miles from the trailhead the trail crosses a small ravine and gentles slightly. Contouring around one last buttress it enters Rainstorm Canyon and tracks the canyon to a saddle on the long ridge that separates Little Dry Creek to the east from Big Dry Creek to the west. This is an increasingly somber bit of trail. At first the fire damage seems pretty minimal – just an occasional snag or two remains standing near to the trail. But as you ascend each stand of snags get thicker and these stands get closer together. The fire has introduced an entirely new ground story. This canyon wall is thick with grey oak, Gambel’s oak, small mountain mahogany and a plentitude of single-stalk, long-thorned plants that you may learn to avoid. A nice ponderosa forest would have been wonderful, but clearly the flora in these mountains are coming back. The fire was not as intense at Windy Gap and a nice stand of fir trees remain standing. That they were damaged is not in doubt (the trail was thick with fallen branches). But this patch of surviving forest makes for a nice segue onto the ridge line. From the Gap the chief view is across the upper reaches of Big Dry Creek. Holt Mountain stands to the northeast and Grouse Mountain stands to the north. On this date Windy Gap was well named, provoking a quick change into warmer attire. December is wintery, even in this far-southern mountain range. The ridge crest and the northeast side of the ridge suffered greater damage than the Little Dry Creek side. You may find that the trail above you is strewn with debris. Don’t let that stop you. It is perfectly possible to pick your way past the deadfall and rise up into the higher reaches of the Mogollons. On this date I was only able to go another half mile before hitting my turnaround time. There is a small, flat-topped rib that juts south into the upper basin of Little Dry Creek. The rib terminates with a dramatic cliff. Some generous soul has positioned a big, bleached elk horn on the top of that cliff. Past the horn you get a fantastic view down Little Dry Creek and your path back to the trailhead. Get those boots on and go. The internet is nothing compared to Little Dry Creek. There were quite a few cattle along the starting stretch of the trail. They seemed to be pretty comfortable around people, but if you encounter them then give them as wide a berth as you can. They are not gazelle-like in any way and they do not move comfortably on uneven terrain. I went through a liter of water and had another two liters available. That was probably overkill for a cool winter’s day. I suspect that Little Dry Creek earns its middle name in most months. It would be wisest to bring along all the water you may need. It would have been great to have a few more hours in the day. 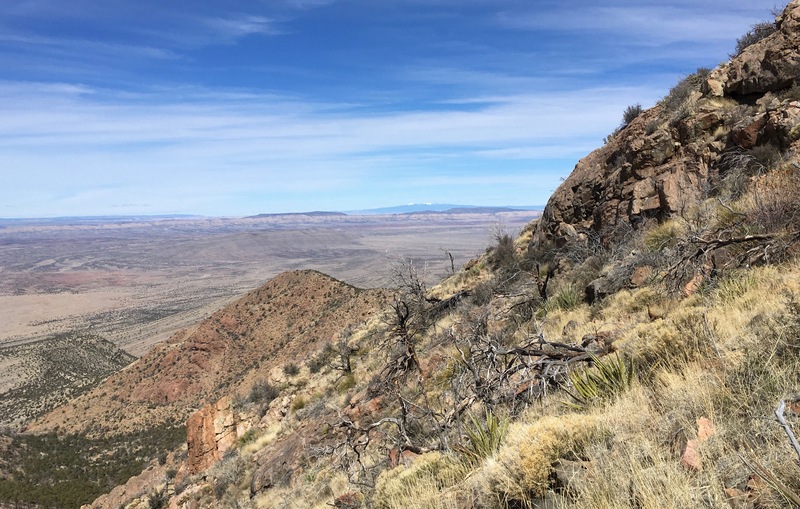 This would be a terrific mid-May hike if you wanted to get to the summit of Sacaton Mountain or Black Peak. Consider bringing along some garden shears and a harsh attitude towards thorn bushes. 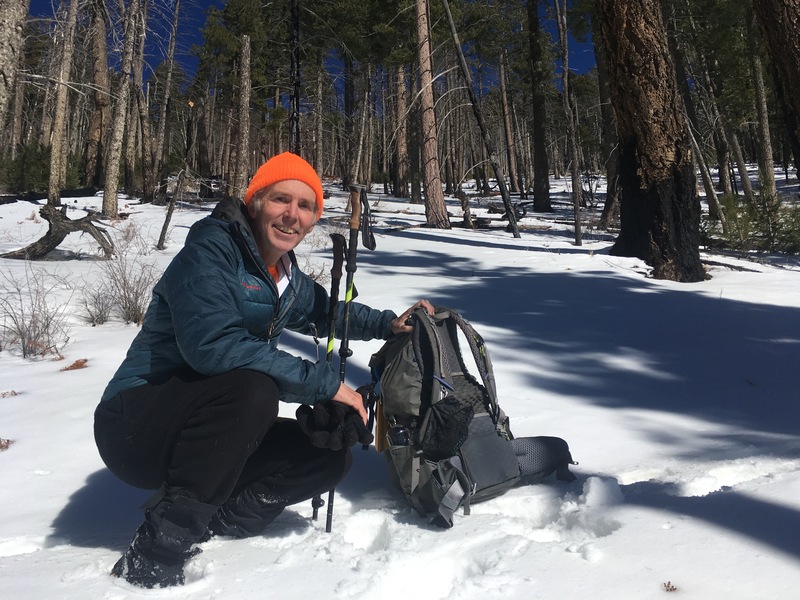 Hopefully, your efforts will make others more comfortable on the trail and perhaps the Forest Service may take note of increased public interest. 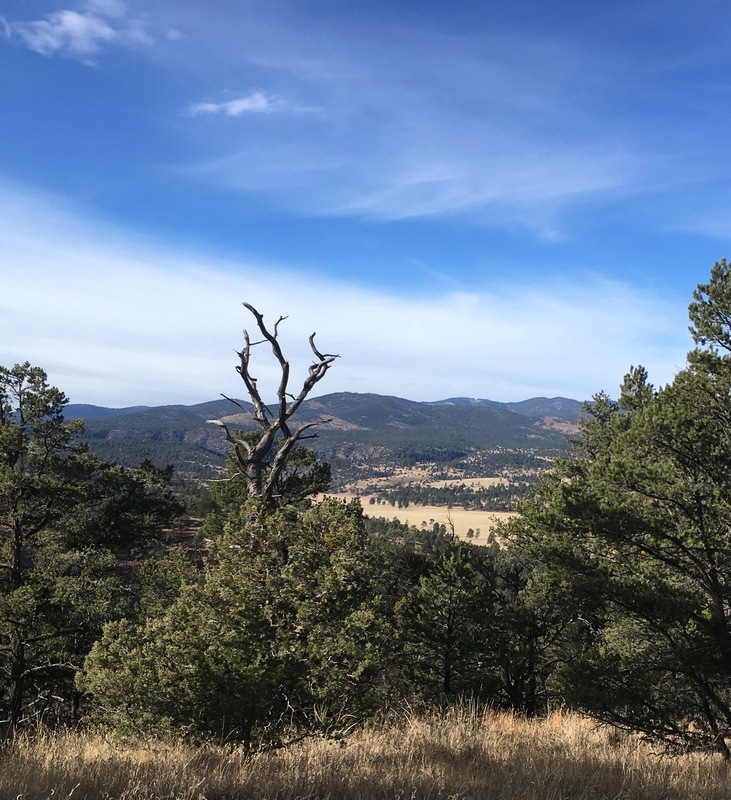 As mentioned in the earlier post, there are descriptions and discussion of this trail at both the Casitas de Gila Nature Blog and at Doug Scott Art. The Forest Service website has a report dated 2012 that indicates that the Little Dry Creek Trail is officially closed. (The site also notes that it is not being actively update due tot the the partial government shutdown of late December, 2018). They tell readers, “Visitors are reminded that wildernesses are places where safety is a personal responsibility.” This is true. 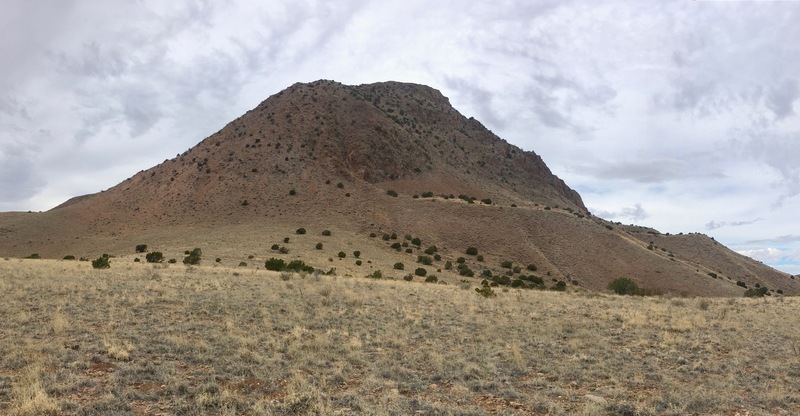 View of ridge containing Black Mountain from NM-59 (foreground peak is probably Beaver Points Mountain). This hike is a mellow stroll to a lookout tower on the northern edge of the Gila Wilderness. Wolf Trail #773 has a clear tread, a manageable vertical gain and a summit low enough to be snow-free for much of the year. 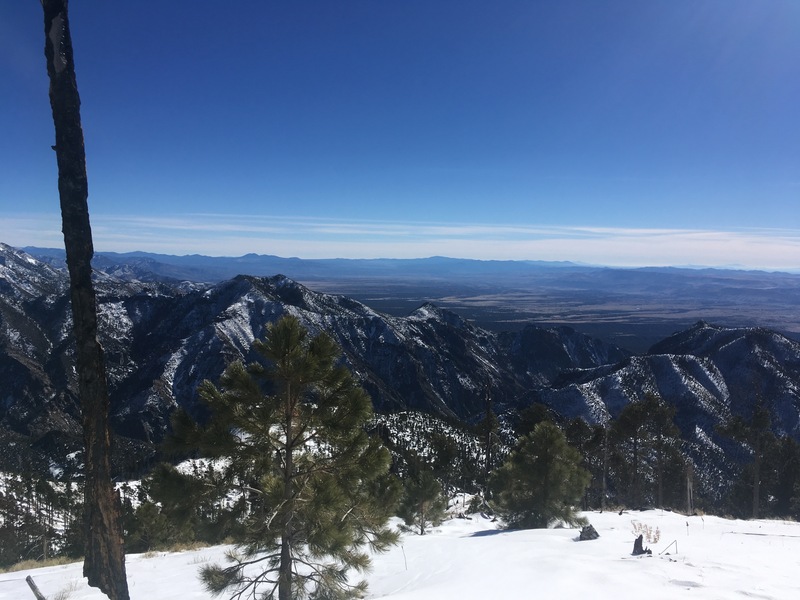 The summit view swings from Vick’s Peak in the San Mateo Range to the northeast, passing Hillsboro Peak in the Black Range to the east, Black Peak in the Pinos Altos Range to the south and winding up on Whitewater Baldy in the Mogollon Mountains to the west. There may be no better place for getting an overview of this huge and varied National Forest. The roads are paved for much of the way, so access is relatively easy. These roads do wiggle and writhe, however, so getting here is not especially fast. 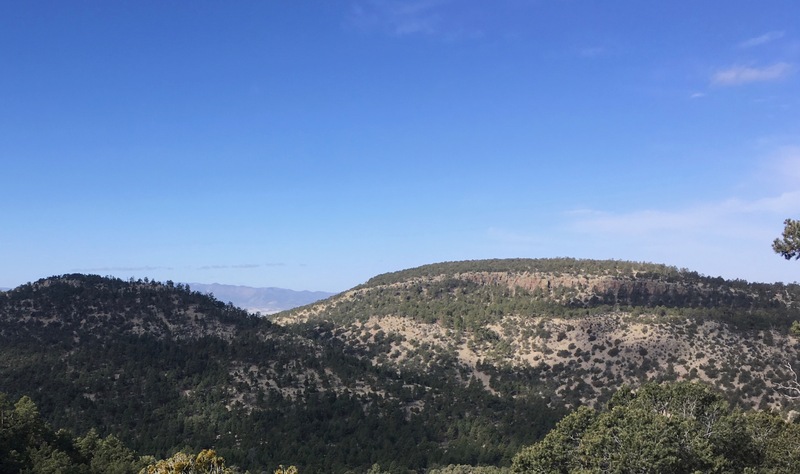 To be clear, this is Black Mountain in Catron County on the northern boarder of the Gila National Forest. 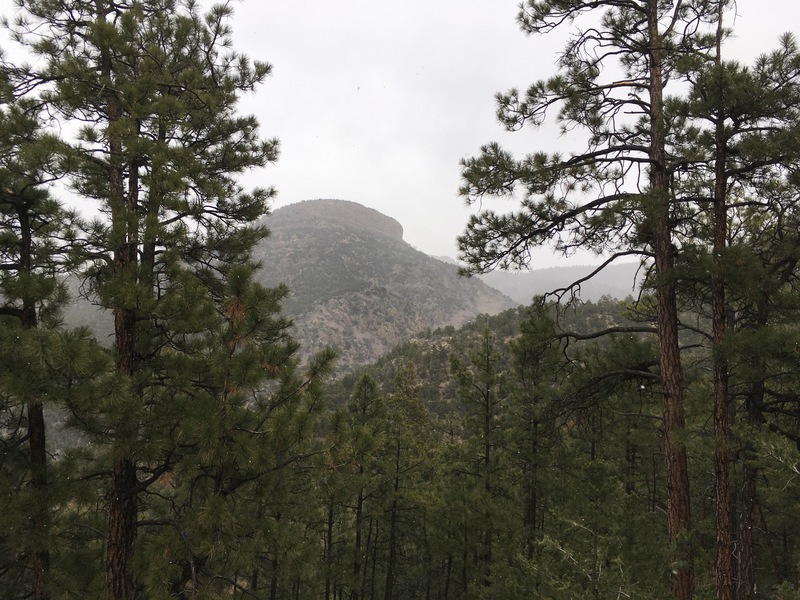 It is not Black Peak (near Signal Peak) on the southern border of the Gila National Forest. Nor is it Black Mountain (near Whitewater Baldy) on the western border of the Gila National Forest. 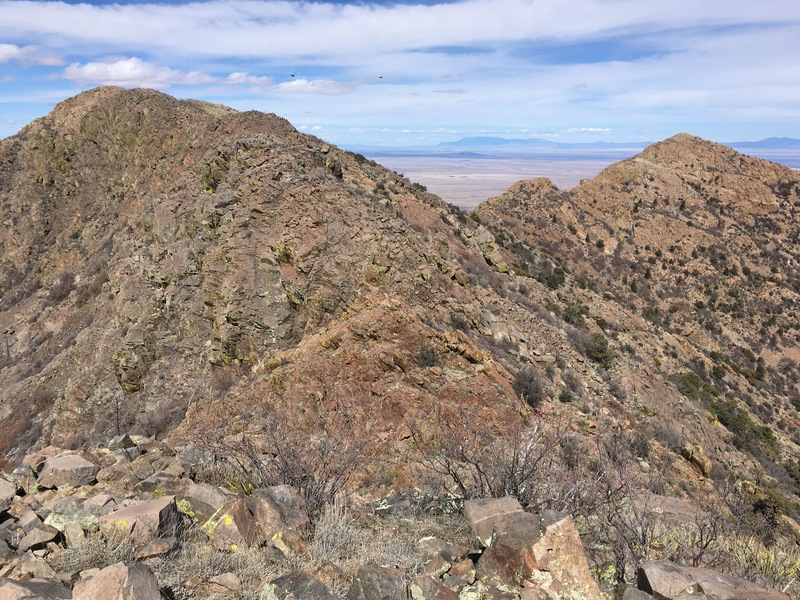 In fact, none of these peaks lie within the Black Range on the western border of the Gila National Forest. The directions given here are from Silver City, NM, south of the Gila National Forest. Many people going to this trail will come from the Interstate-25 (I-25) corridor. Those people may want to skip down to where it says, “veer right onto the Exit 83” and follow from there. From the junction of US-180 and NM-90 in Silver City, go east on US-180. After 66.1 miles on NM-152 turn left onto the on-ramp for I-25 North. The junction is well signed. After 20.0 miles on I-25 North veer right onto the Exit 83 off ramp for Elephant Butte. After 0.2 miles, at the end of the off-ramp, turn left onto NM-52/NM-181. These roads were not signed at this junction. Instead, look for a sign that has a large, left-pointing arrow labeled, “CHUCHILLO”. That arrow will point you in the right direction. After 2.4 miles on NM-52/NM-181 turn left onto NM-52 North. (NM-181 continues straight ahead). The junction is well signed. After 38.0 miles on NM-52 North turn left onto NM-59. The junction is well signed. At 31.4 miles on NM-59, just after a cattle guard, the road turns to gravel and splits. You should turn left to stay on NM-59. The road quality here is currently very good. Google Maps seems to think that this gravel segment is a combination of both NM-61 and NM-59, but currently it is only signed for NM-59. At 32.0 miles on NM-59 turn right. An unsigned gravel road continues straight ahead, but it is not NM-59. The turn at this junction is well signed. The road quality remains fairly good but in places the road bed has numerous embedded rocks to rattle your vehicle. This portion of NM-59 also has Forest Service signs indicating it is also known as Forest Road-141. 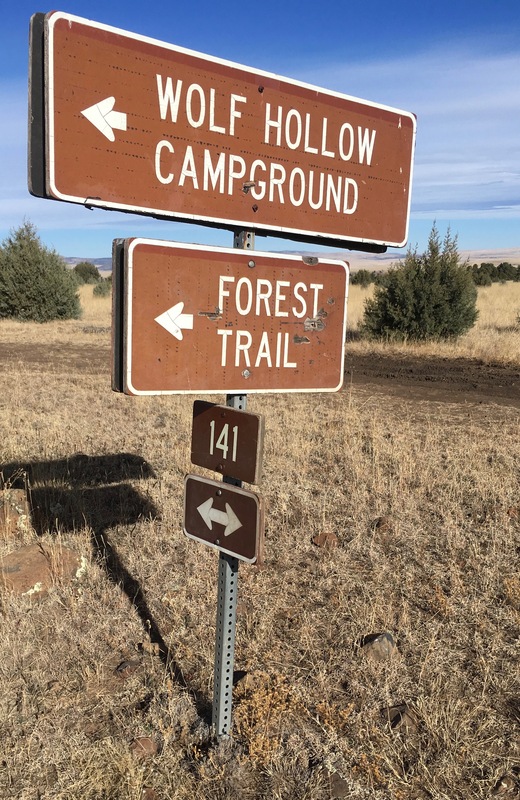 After 37.5 miles on NM-59 (just past mile marker 37) turn left onto Forest Road 991, also signed for Wolf Hollow Campground. After 0.7 miles on FR-991 come to a loop at the end of the road, in a Forest Service campground. There are numerous places along NM-52 where the road descends sharply into washes and are signed “DIP”. When water is flowing in the wash it will go directly across the crown of the road. Be careful under wet conditions. In many of these dips flowing water has sculpted deep holes in the sand adjacent to the paved road. Don’t let your passenger side tires ride out onto the road margins. FR-991 looks as if it recently received a couple loads of crushed rock, which is great. Unfortunately, the crushed rock is not very well packed down. It can hide the tops of pretty substantial rocks. By going slow and steering carefully it is perfectly possible to take a sedan. This is a Forest Service campground. There is a vault toilet, picnic tables and a corral. I did not see trash receptacles or any source of water. At the southern end of the loop there is a small kiosk that says “Wolf’s Hollow Campground” and a second sign saying only, “Trail”. This is trail 773 to the Black Mountain lookout tower. A second sign, next to the “Trail” sign, warns that this is a wolf relocation area. The trail leaves the campground and immediately enters a broad waterway – a hollow rather than a canyon. The tread is clear and the the angle is shallow. On this date there was a thin scatter of snow on the ground but there did not seem to be any water flowing out of the hollow. This is the domain of small ponderosa and some firs. At first these firs may look a little unfamiliar. The cones scattered nearby, however, will all have “mouse tail” bracts showing that these trees are all Douglas fir. Douglas fir likes moist, cool conditions and it may be that these trees are so stressed that the bark and limbs have been affected. In 0.3 miles you will reach the first of the four gates on this trail. You are welcome to unlatch them and pass through, but please be sure to re-latch them before heading on. The gentle ascent continues, past a second gate, and reaches the hollow’s upper basin in about 1.7 miles. The upper basin appears to be the scene of a fire, most likely the Miller fire of 2011. There is deadfall scattered all over the basin but none on the trail (it was cleared in 2017). The angle steepens modestly and at 2.1 miles you will reach a long switchback that will carry you out of the basin and onto a shoulder leading towards a height of land. This is a false summit and you may scold yourself for thinking that you might be approaching the peak. There are miles to go! From the shoulder, looking north, you will see that the dark, coniferous terrain of the Gila National Forest gives way to pale grasslands. 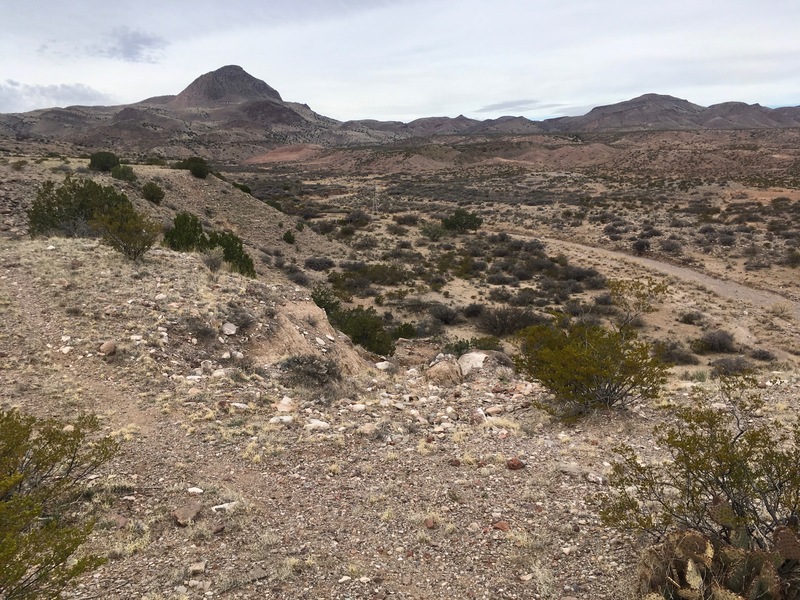 The terrain in the National Forest is considered to be volcanic in origin; numerous calderas have formed and eroded, while Black Mountain itself seems to have been formed by rhyolitic ash-flow tuffs. This soft rock has been carved into innumerable canyons and hollows that radiate, star-like, in all directions from the summit. In contrast, the region north contains broad areas of sedimentary rocks. It may be that the difference in vegetation is a reflection of the geology. The tread climbs the rib as if it were going to the false summit. Instead, it contours below that deceptive knoll to arrive at a saddle about 2.7 miles from the trailhead. There are “peek-a-boo” views thru the trees to the Black Range. On this date the snow had an inch or two in depth, the most accumulation along the tread. Ahead of you is the upper basin of a second hollow that (like Wolf’s Hollow) drains to the northeast. The tread follows the westernmost wall of this waterway while hugging the 9000 foot contour. Eventually it reaches a second saddle at the head of the basin, trespasses briefly on the easternmost wall, and then goes over that wall on a third saddle about 3.5 miles from the trailhead. This saddle has been signed to let you know you are entering the Gila Wilderness Area. At this third saddle you are at the headwaters of another canyon, this one draining due east. The trail makes a broad swing from south to west, dropping slightly, to bring you around uppermost rim of this canyon. You will reach the fourth and last of the saddles at 4.1 miles from the trailhead and go through the fourth and last of the gates. Above and ahead lies the summit block for Black Mountain. The tracked snow on this part of the trail indicated that this region is home to deer, elk, rabbits and bear, with occasional visits from horses. 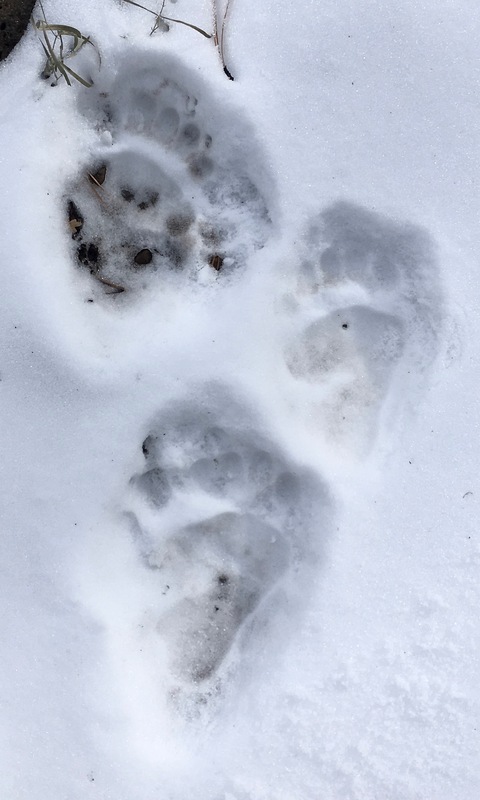 There were no obvious wolf tracks on this date. Mogollon Mountains seen from the fire tower. The trail now ascends briskly, aided by a switchback or two, to attain the summit at 4.7 miles. The fire tower on the summit is reported to be permanently closed. The stairs up to the observation deck are painted and strong, however, and there are stellar views from a perch just below the observation deck. As promised, the entire Gila National Forest is laid out in front of you. It is clear that the forest is walled in to the east by the Black Range and to the west by the Mogollon Mountains. A ripple in the terrain far south of the Black Mountain is Tadpole Ridge. 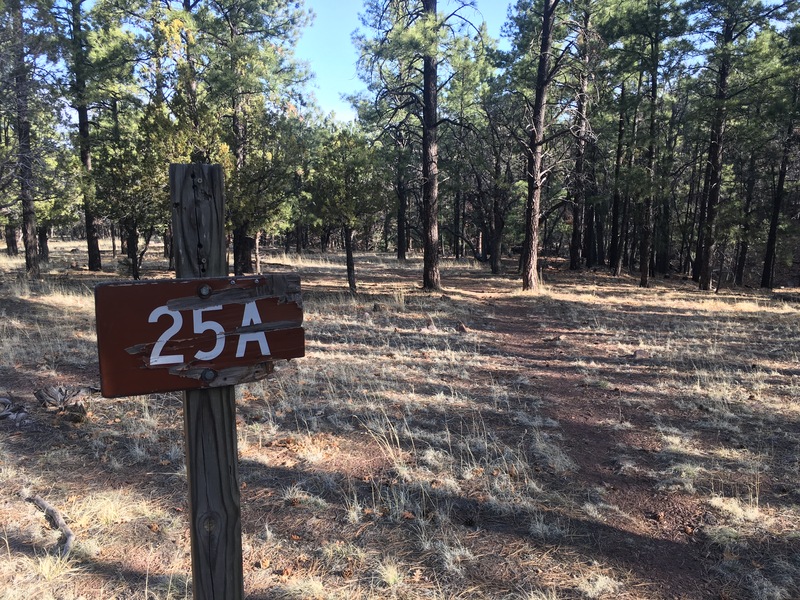 A surprising number of trails depart from this summit: the Sam Martin Trail, #23, the Cassidy Spring Trail #26, the Jordan Trail (signed as #26, but shown as #20 on most maps) and a trail signed CCC /East Fork (which is likely the CCC Canyon Trail #772) venture off in various directions. Pull on some warm gear, have a bite to eat and consider your many options. Most day hikers will probably return the way they came, down the Wolf Trail, #773. It was a poor decision to go hiking in December in trail shoes. Boots would be warmer and more resistant to snowmelt. On this date the accumulation of snow did not call for either micro spikes or poles, but that is very subject to change. This seems to be a notably lonesome hike. Arrange matters so that someone will know when you are supposed to return. It isn’t clear how much of a safety issue arises with the wolf-release program. I haven’t seen reports of wolf encounters with hikers, hunters or ranchers. Injuries and fatalities to livestock are known, however. 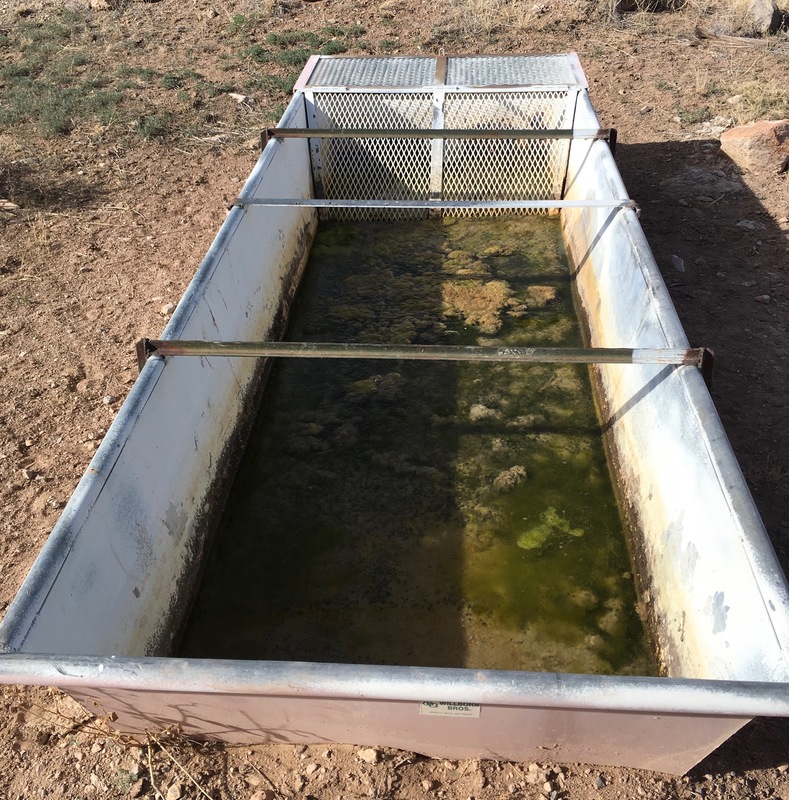 A recent report indicated that there were 50 such incidents in the first half of 2018, or about two per week in New Mexico. If you want to explore in rarely-visited terrain the the trails leading from the summit could be the answer to your wishes. A large loop could be constructed by heading out on the Jordan trail and returning via the Sam Martin Trail (with several other trails used to link). The quality of these treads is unusually uncertain and you’d want to think carefully about how to secure water along the way. As noted in the Overview section, there are many heights of land nearby that are named “Black”. Internet searches will turn up many false positives for this trail! There is a fascinating website called PeakVisor.com in which you can enter a summit name and get a sketch of the surrounding peaks along with labels for them. Scrolling left or right allows you to go around the full compass circle. There is an associated phone app with similar capacity and it might be a great tool for backcountry navigation. (I haven’t tested it). This is the link to the sketch from Black Peak. The Forest Service site has a map, and is particularly useful for getting information on the official trail numbers for all those trails leading off of the summit. The NaturalAtlas site is even better since it includes names as well as trail numbers. It is slightly shocking to report, but either my internet search skills have deserted me or this mellow gem seems to be completely unknown on the web. Please let me know if you find a link or have added a trip report of your own.